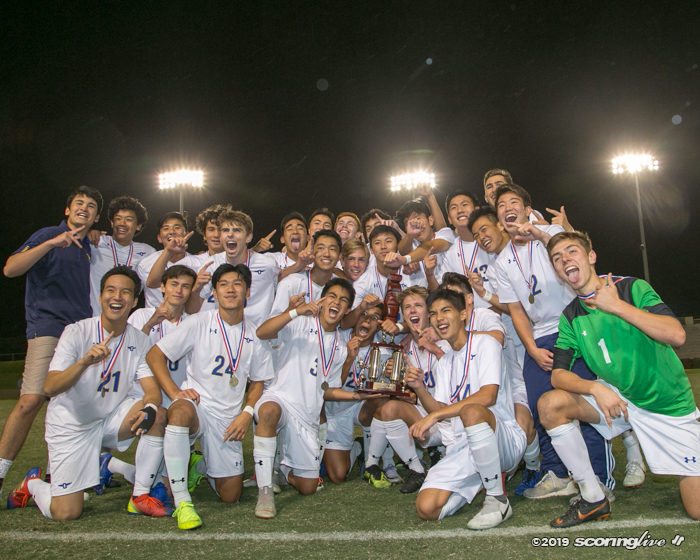 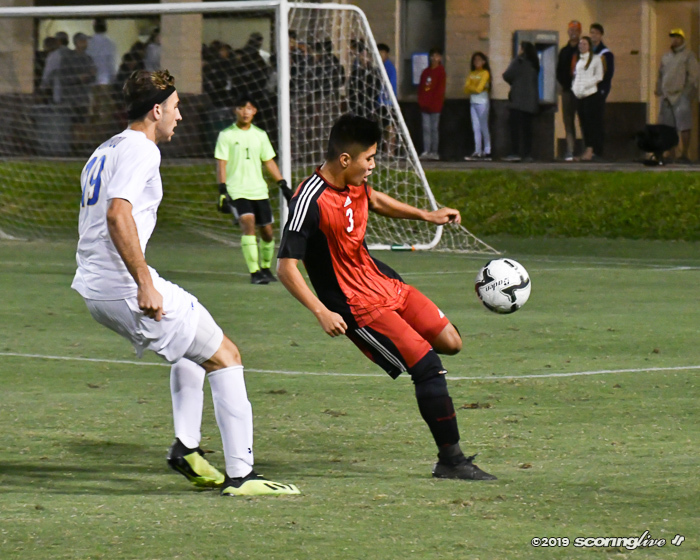 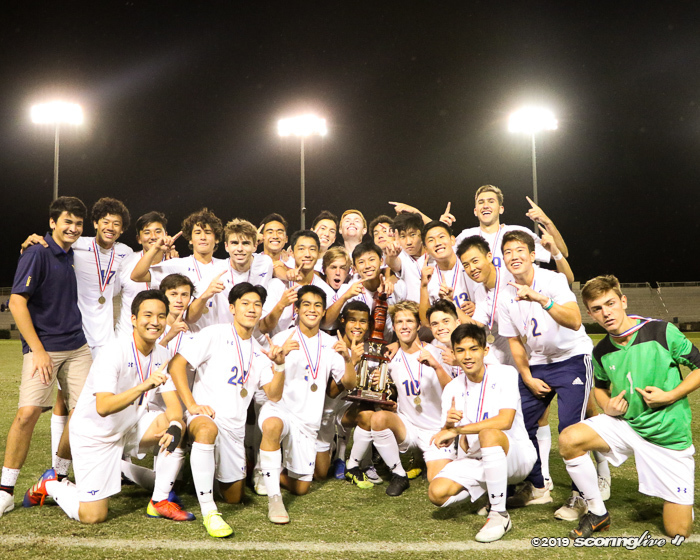 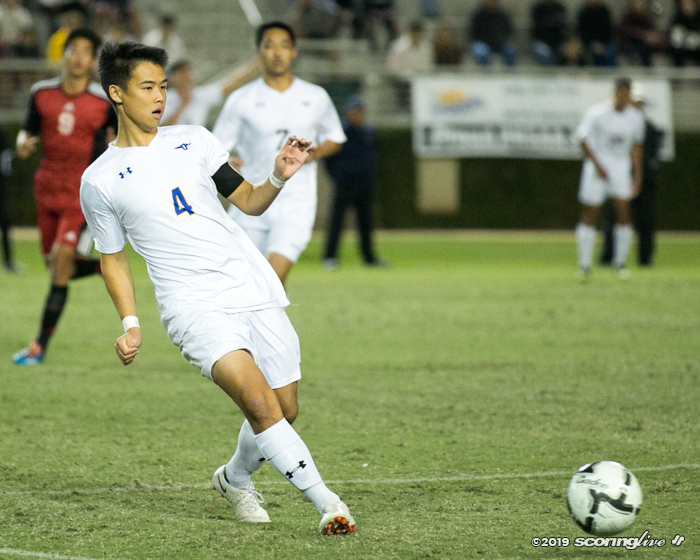 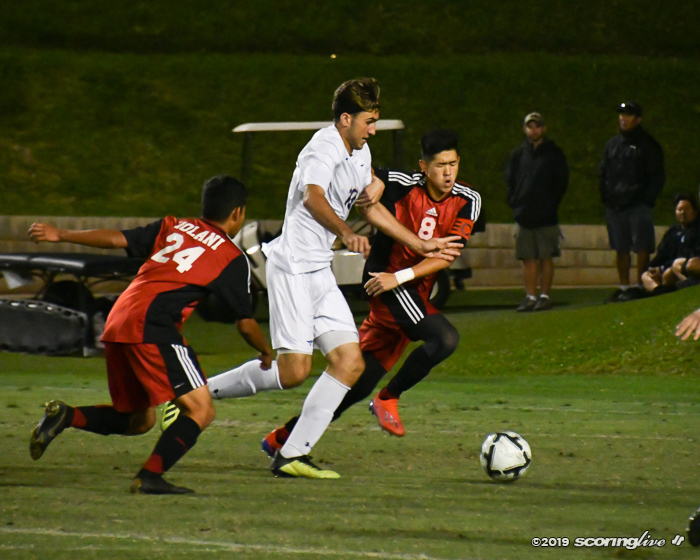 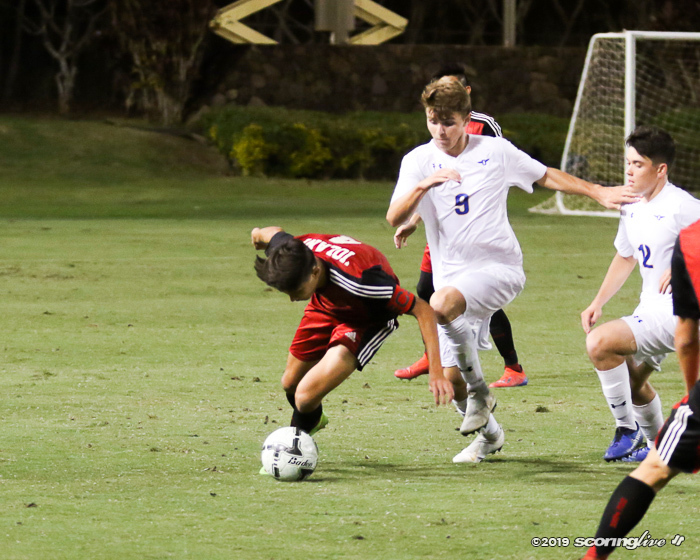 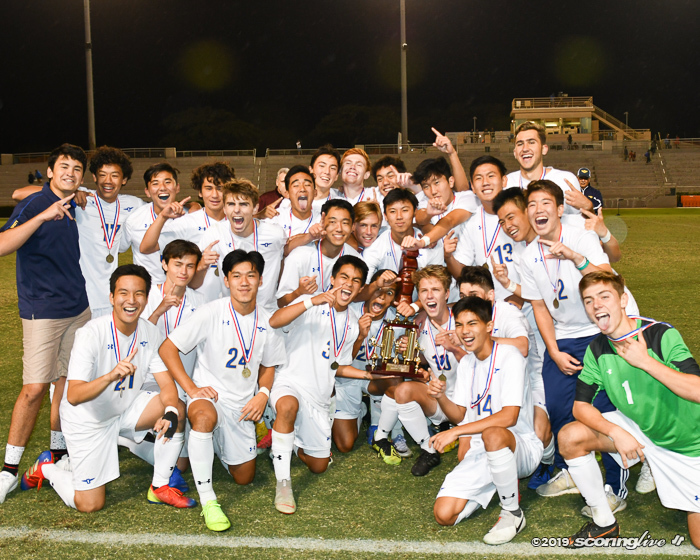 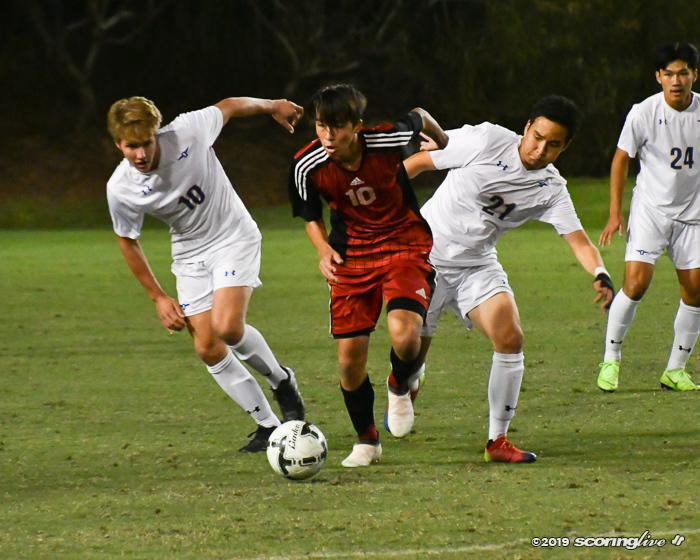 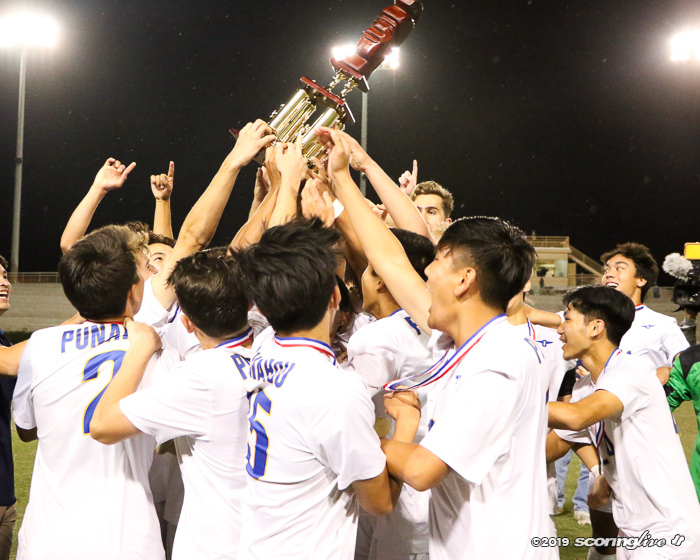 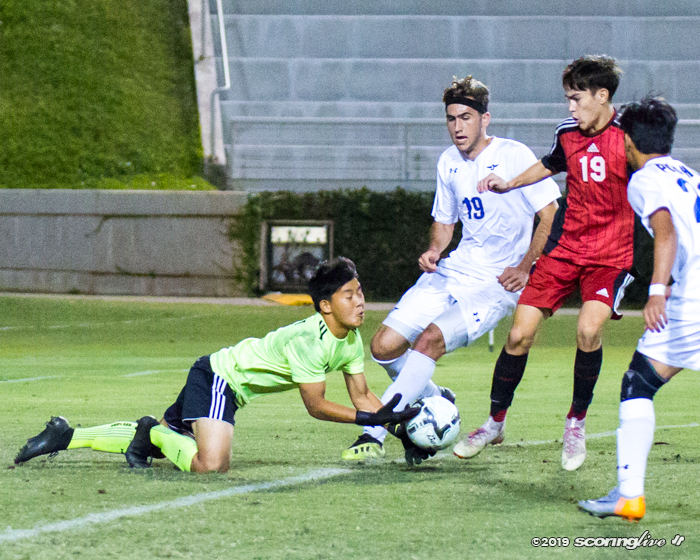 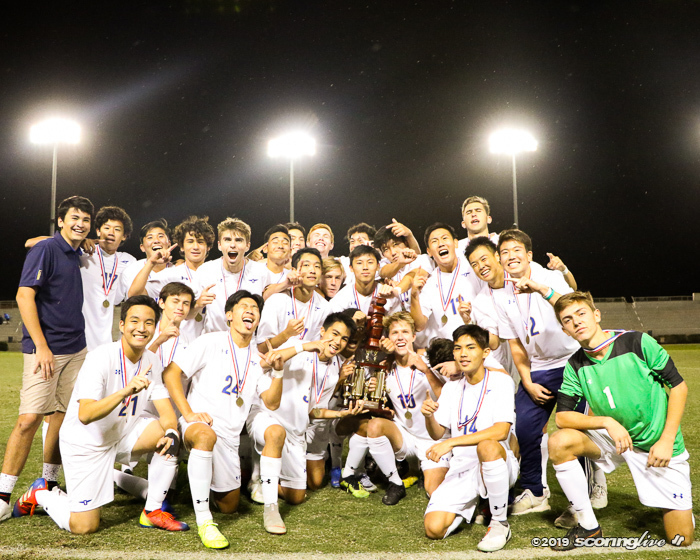 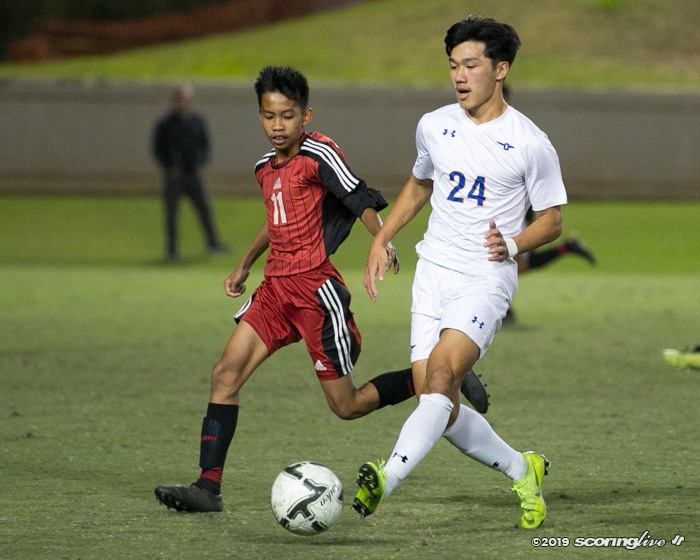 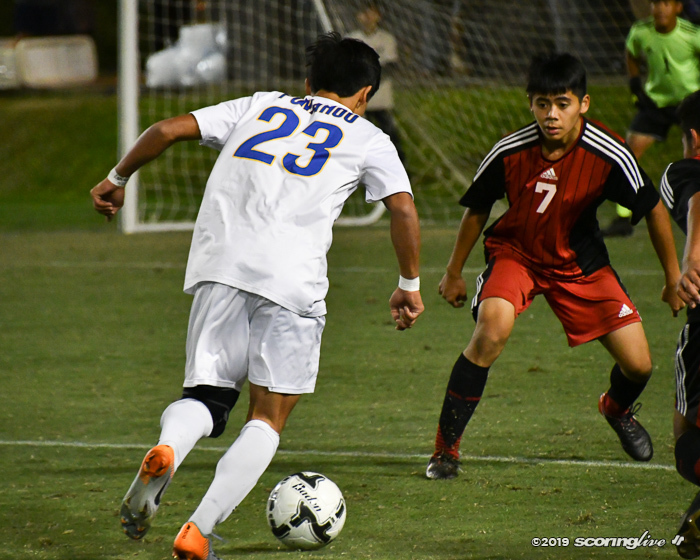 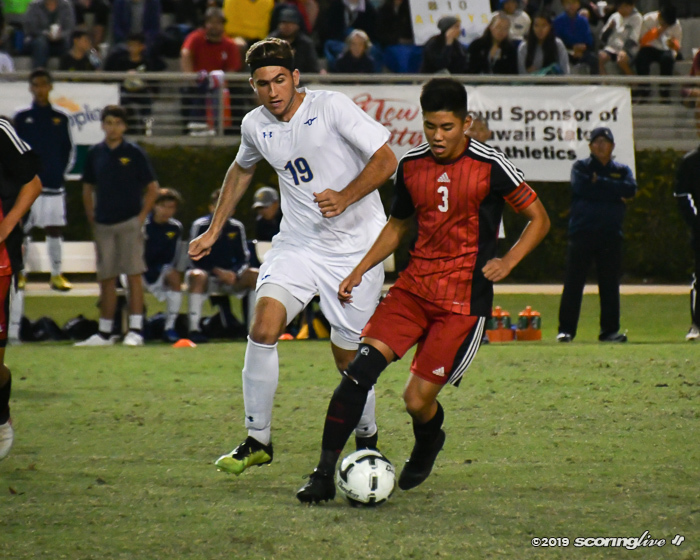 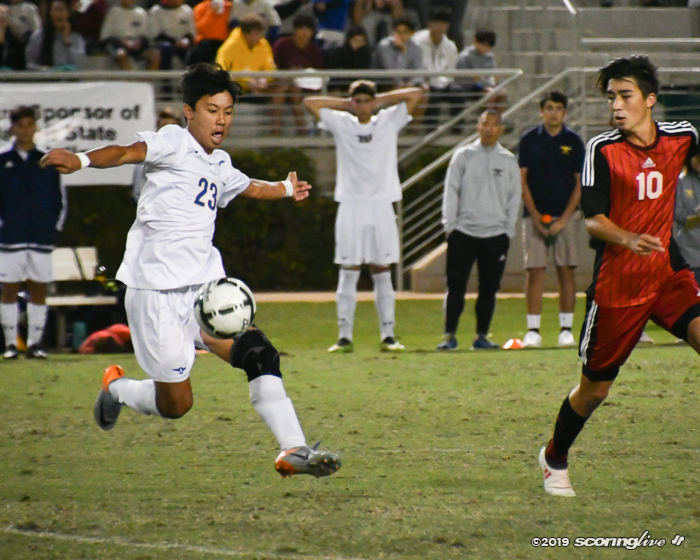 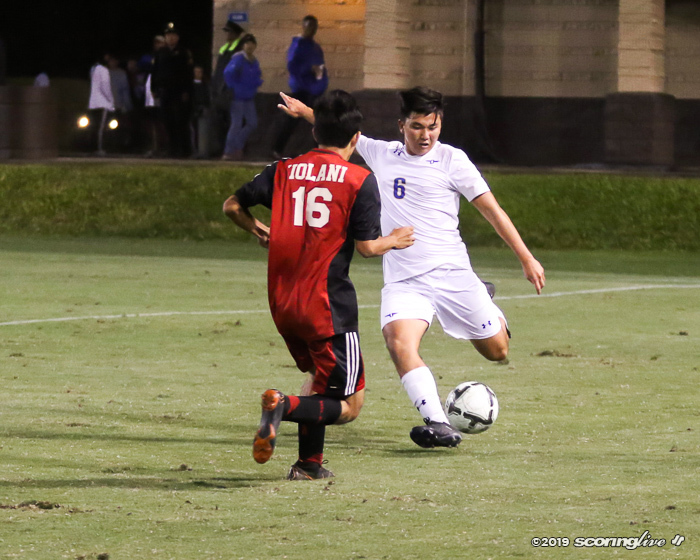 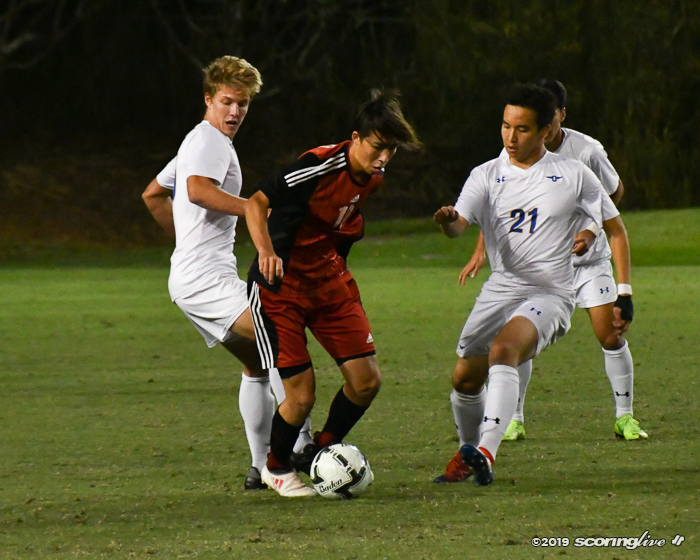 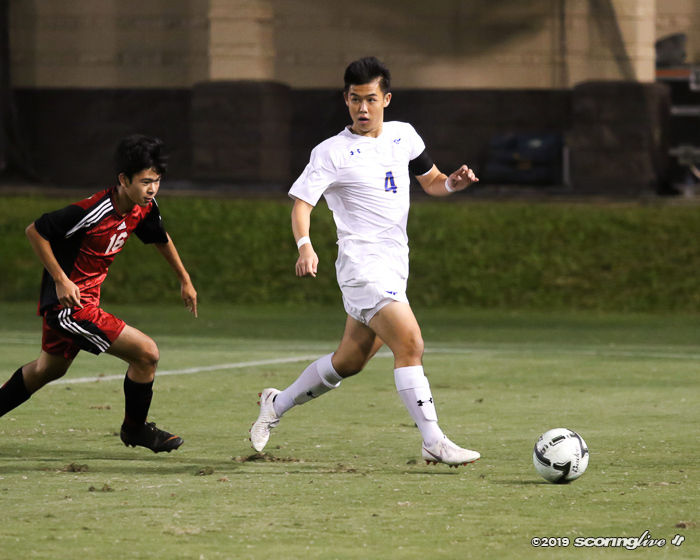 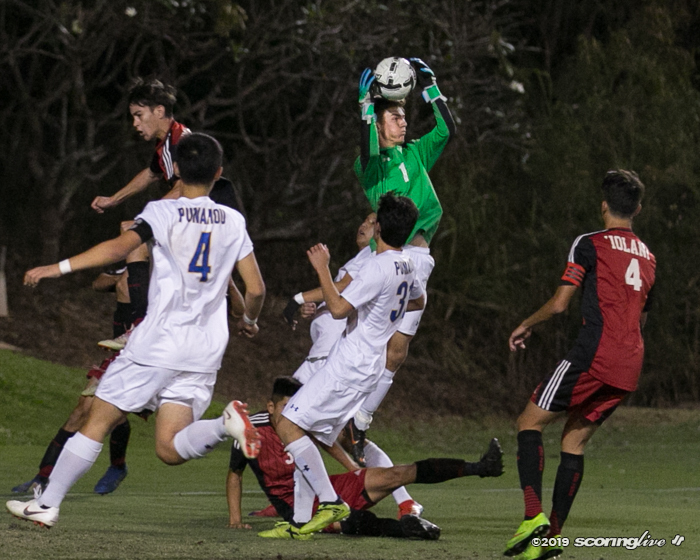 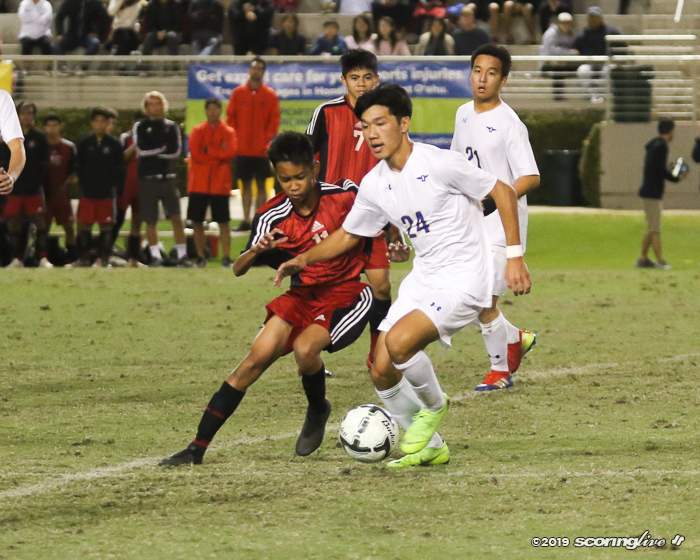 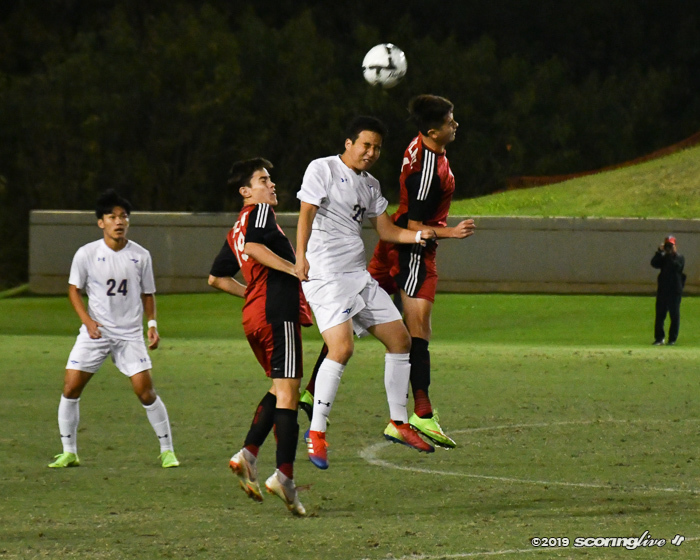 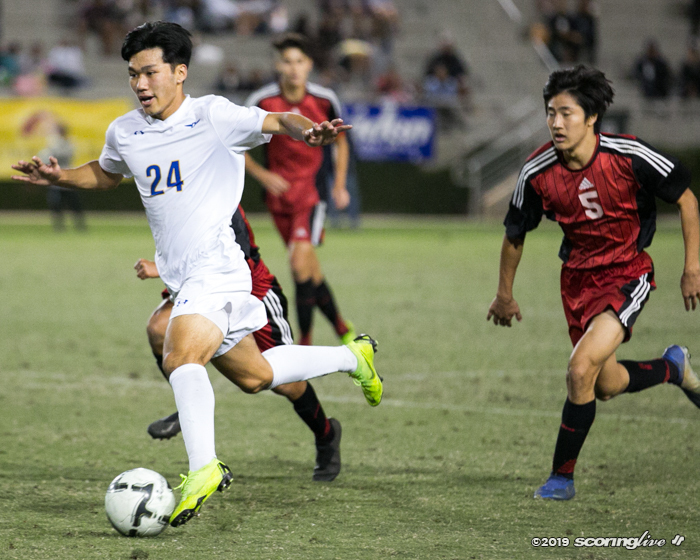 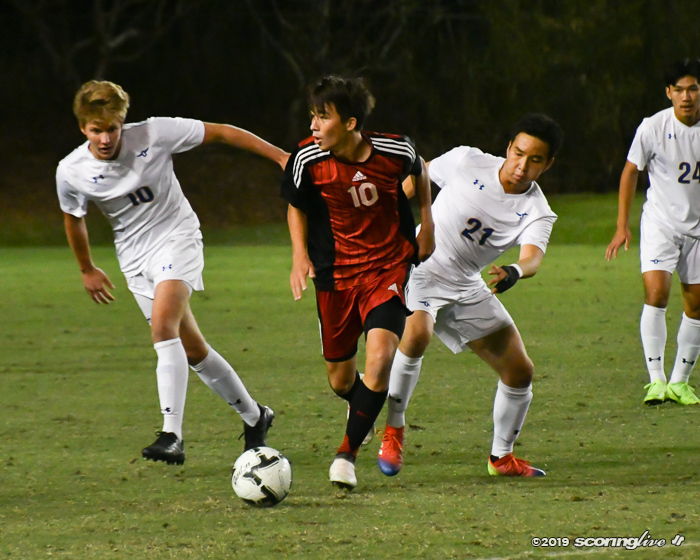 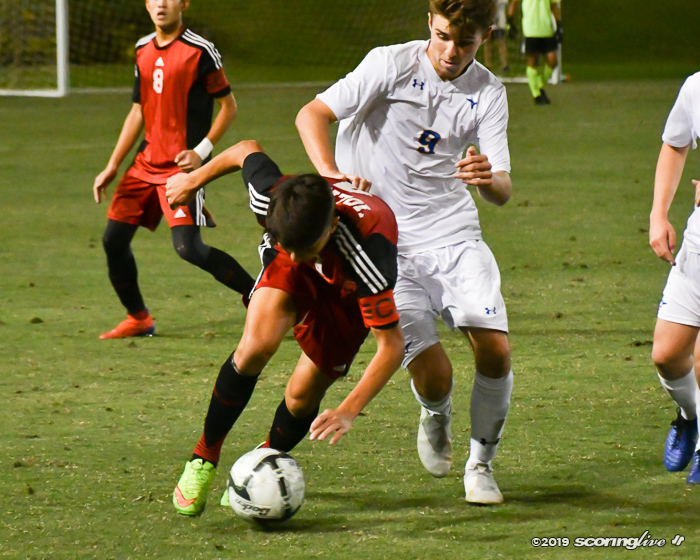 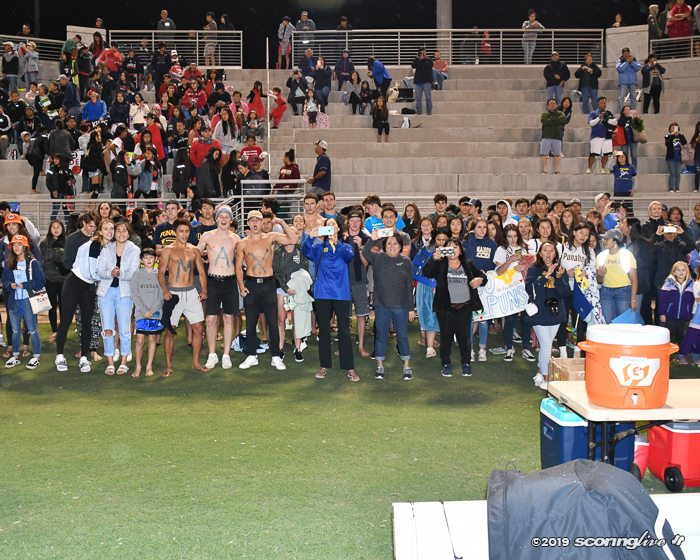 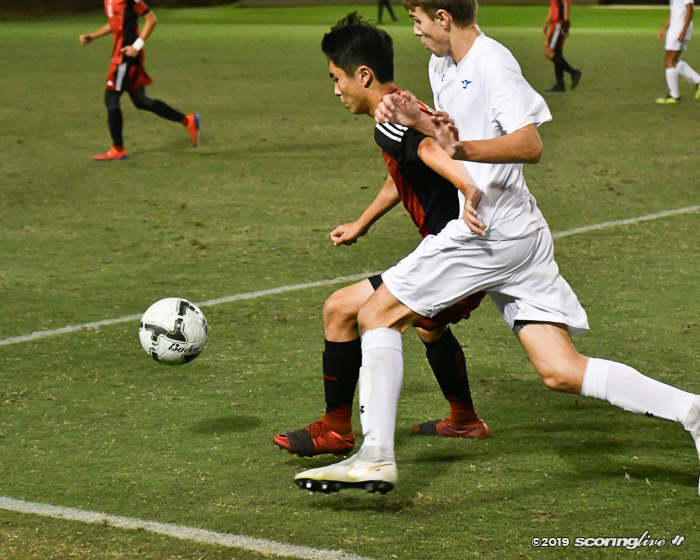 WAIPAHU — In all of its meetings with Iolani during the 2018–2019 ILH season, the Punahou boys soccer team was the one that had all the smiles after the match. 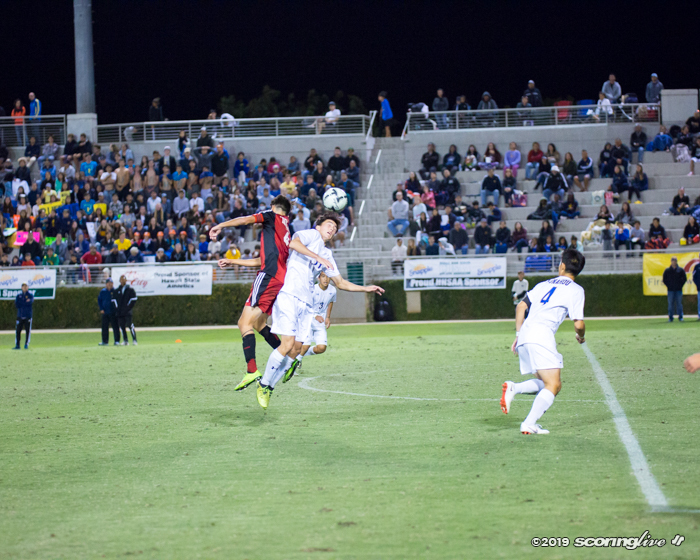 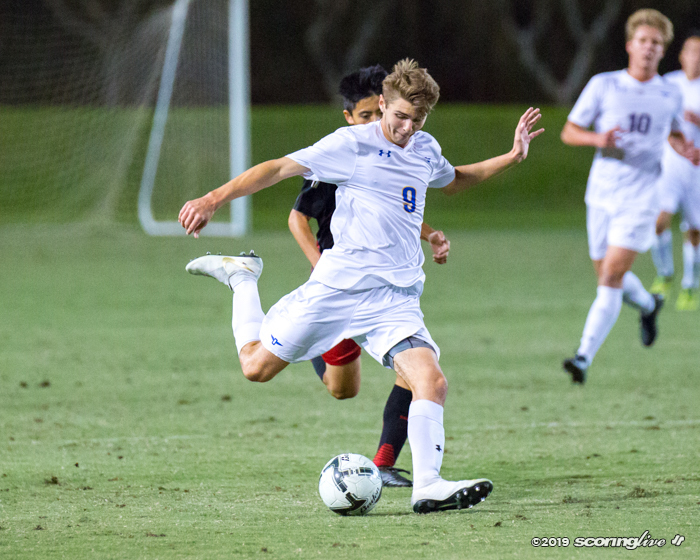 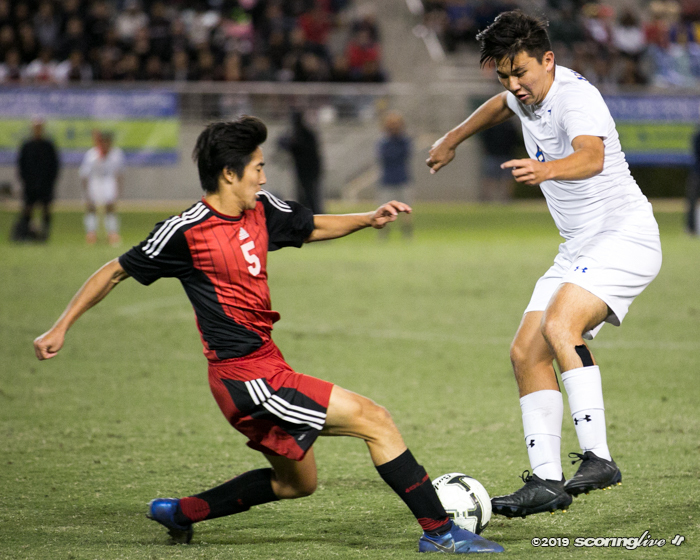 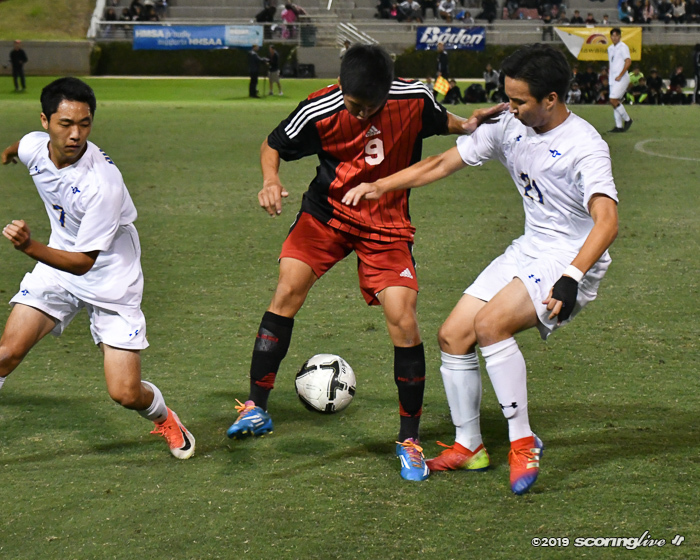 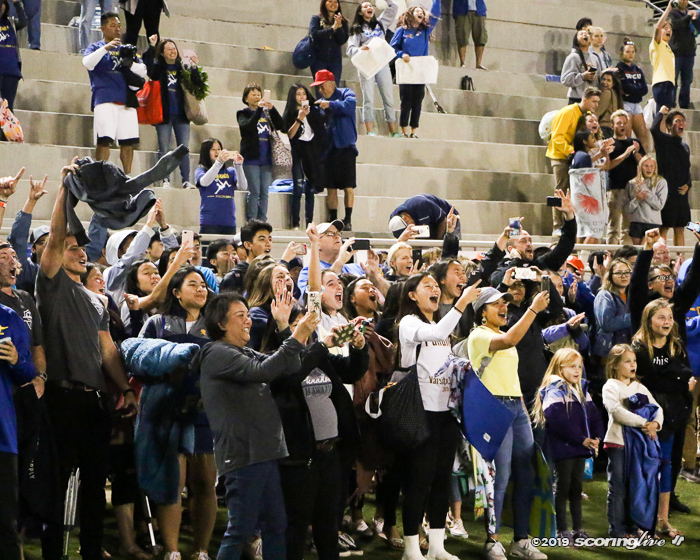 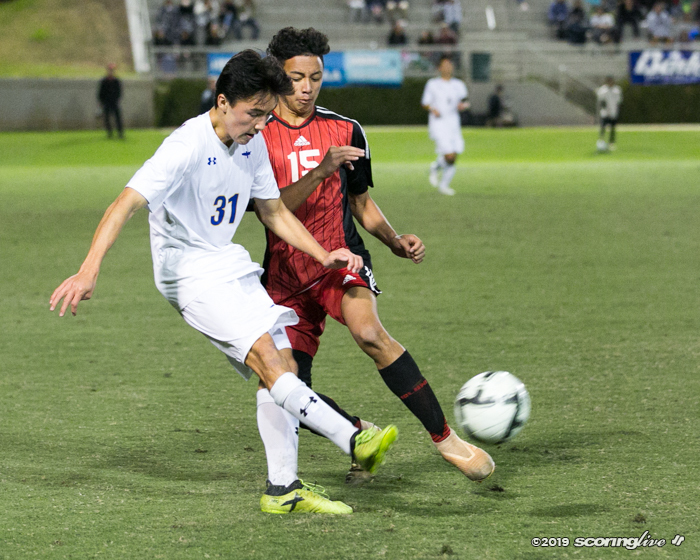 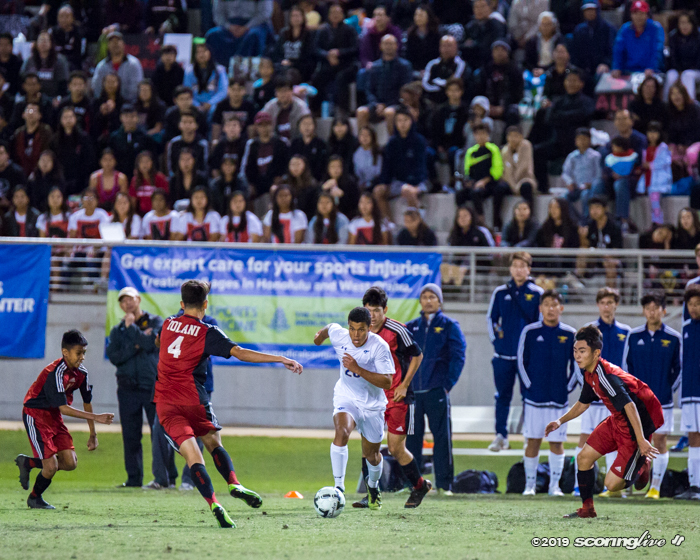 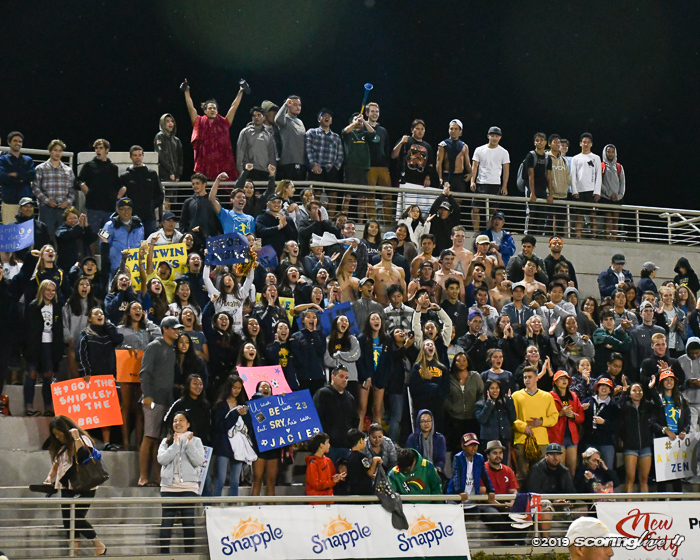 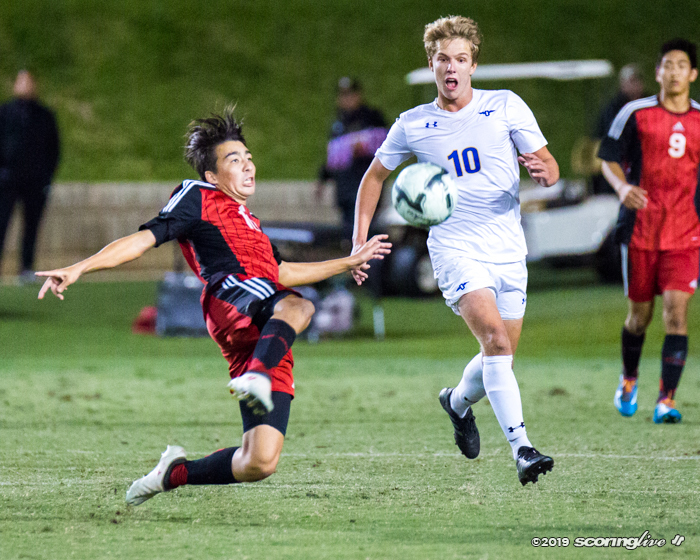 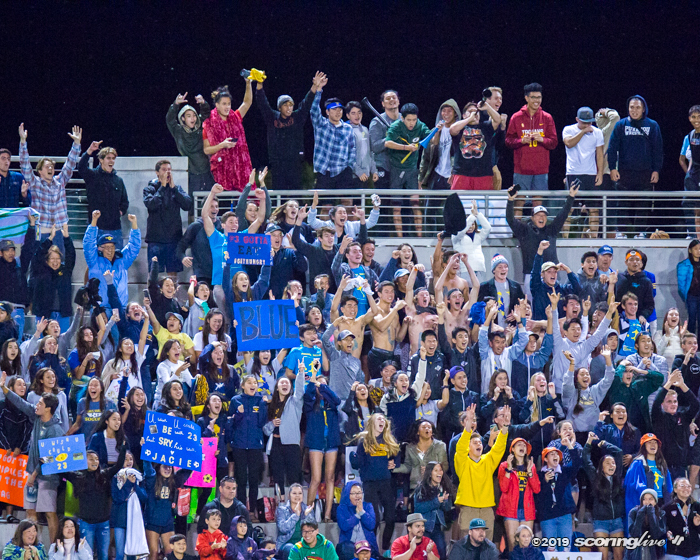 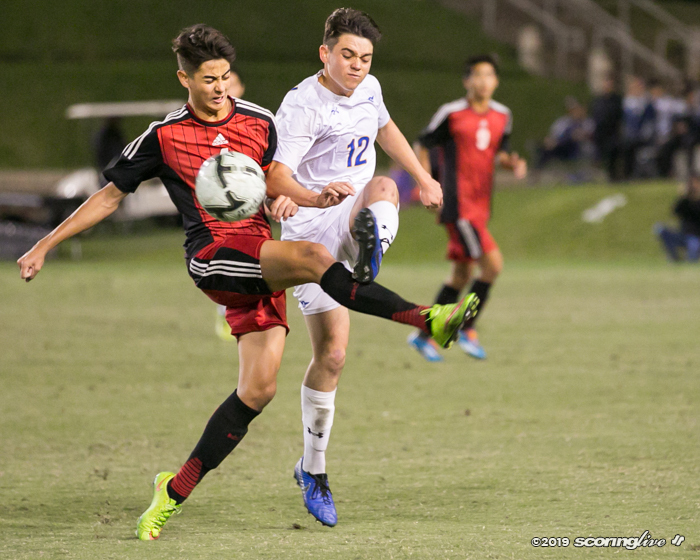 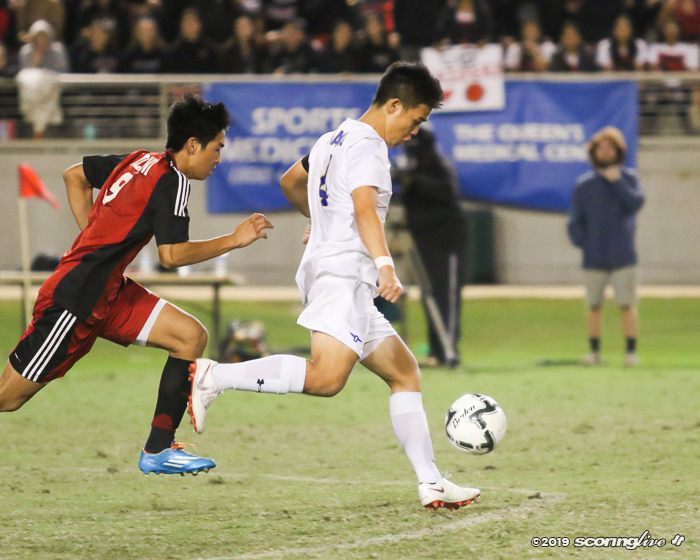 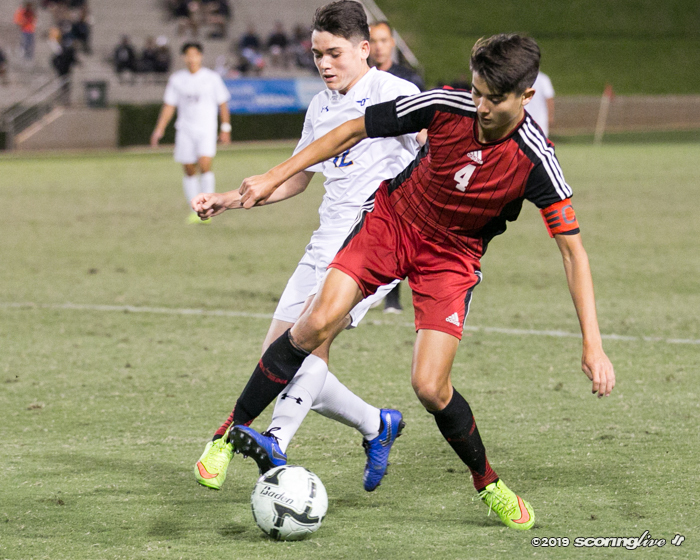 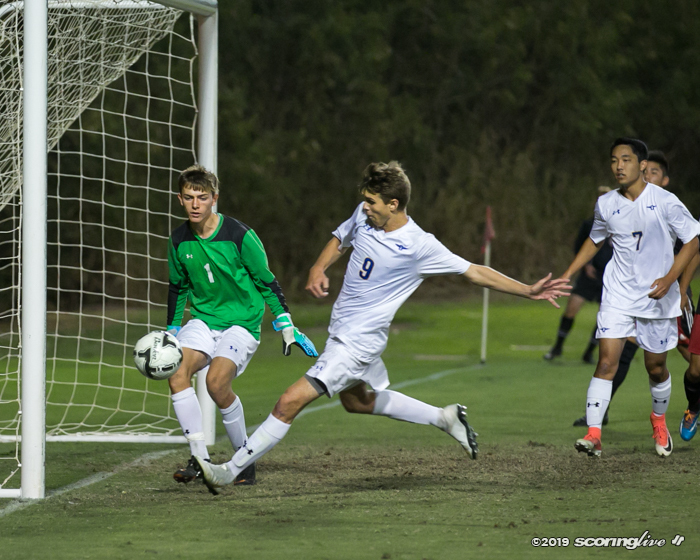 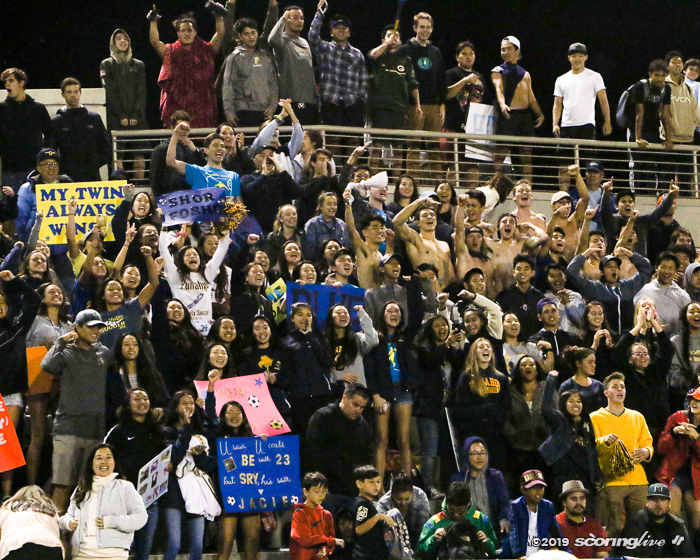 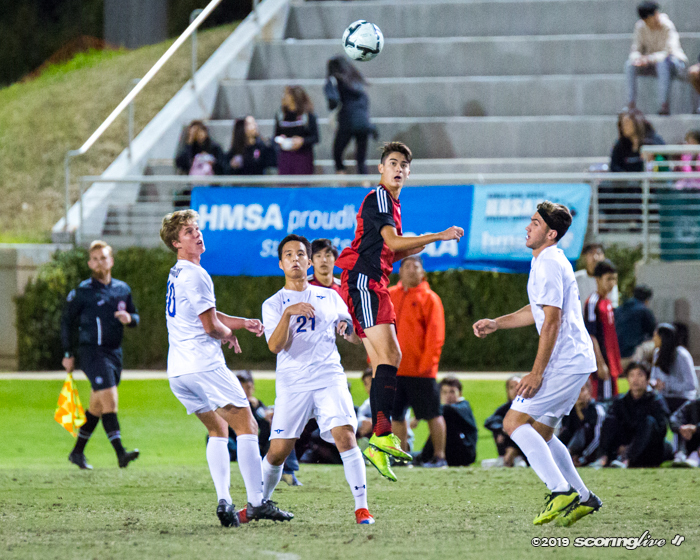 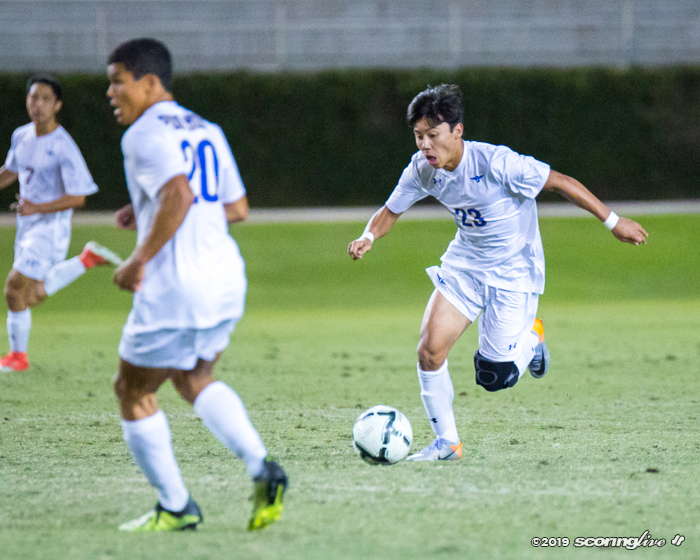 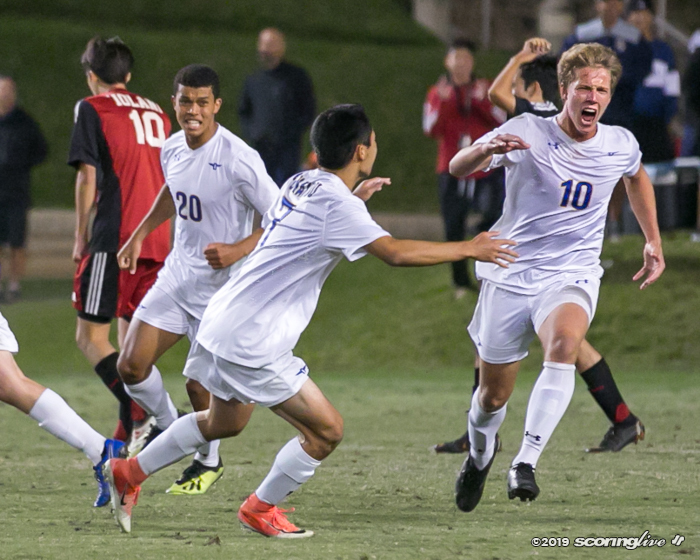 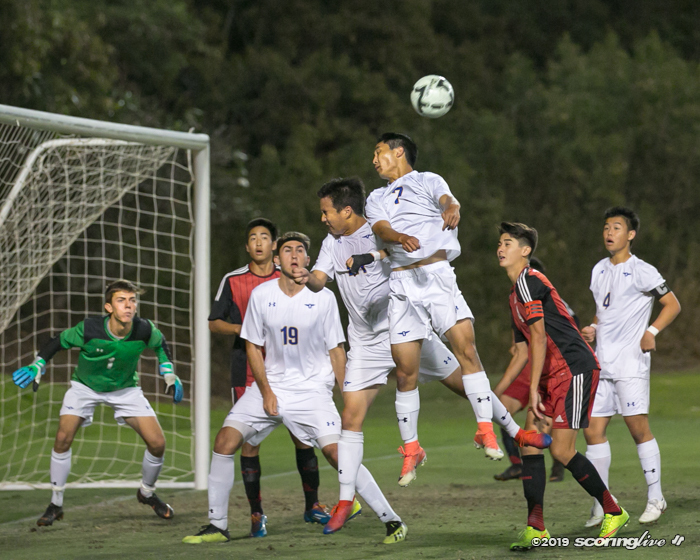 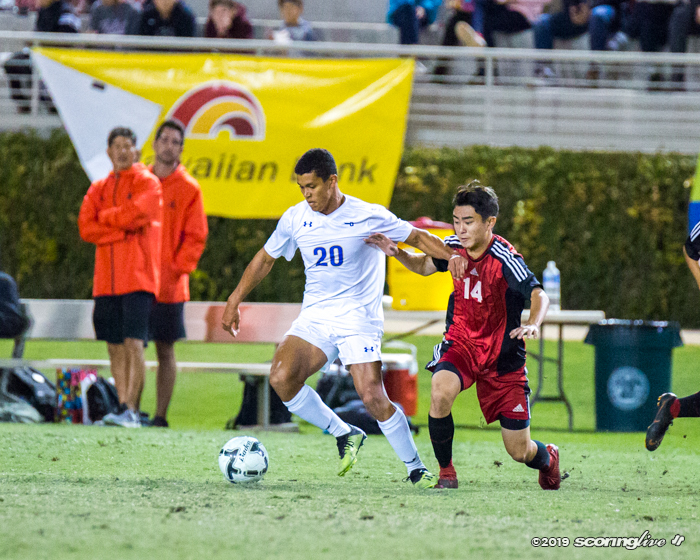 Saturday night in the Queen's Medical Center Division I Boys Soccer Championships was no different. 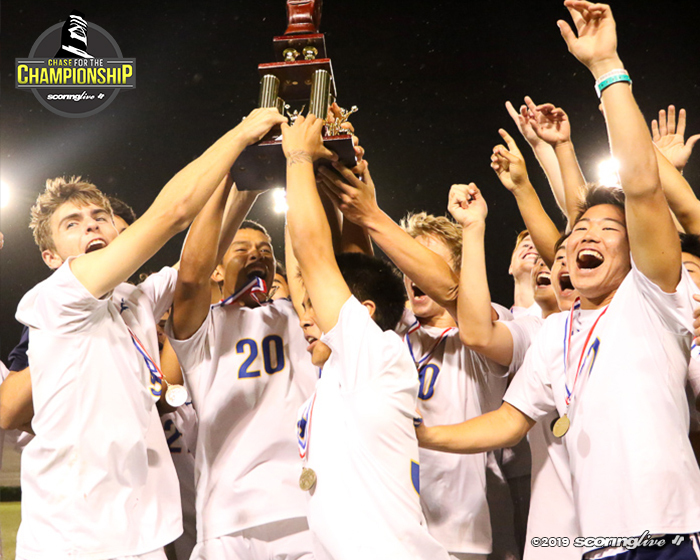 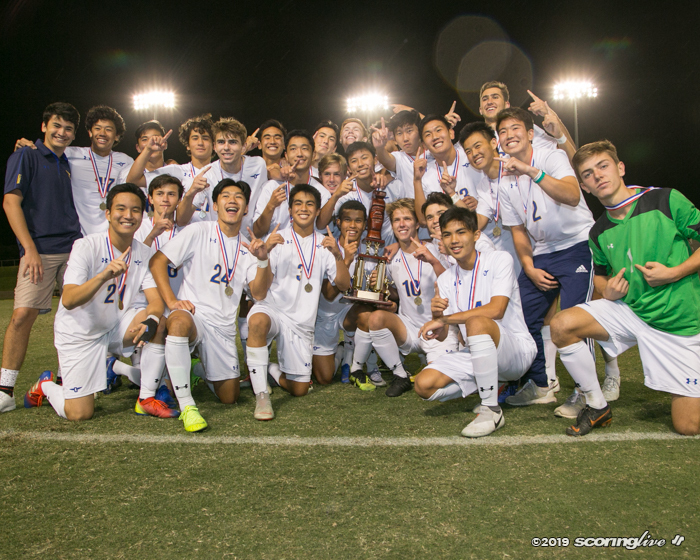 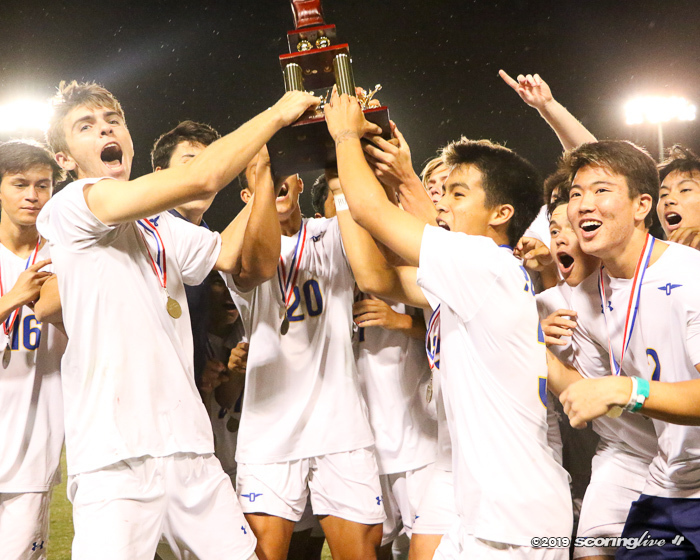 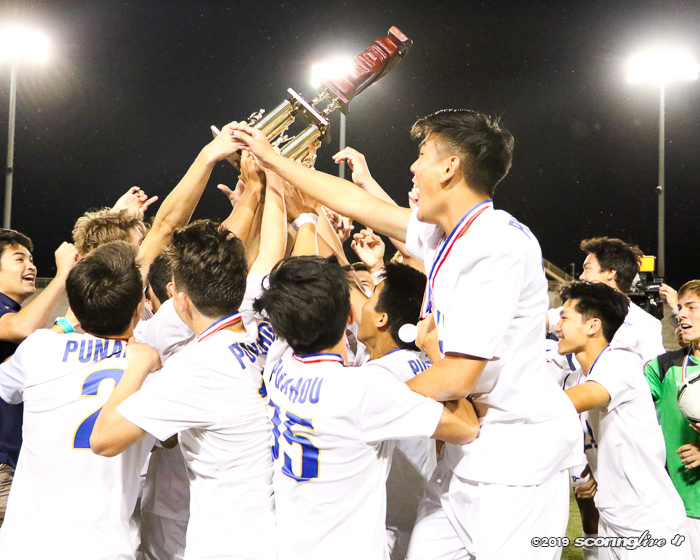 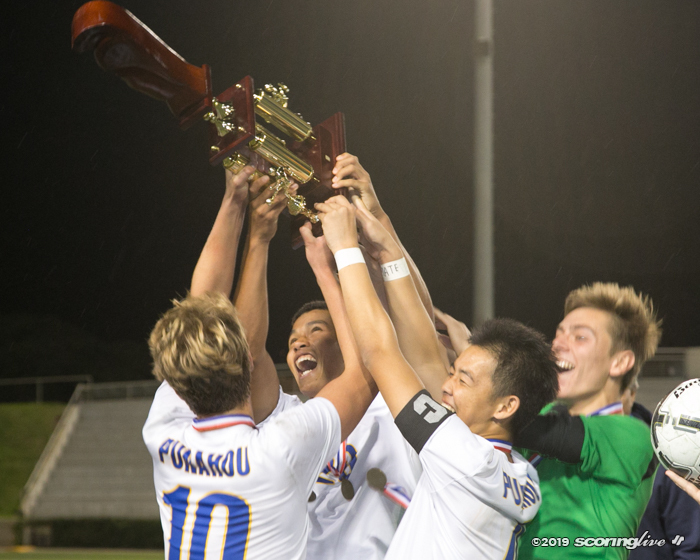 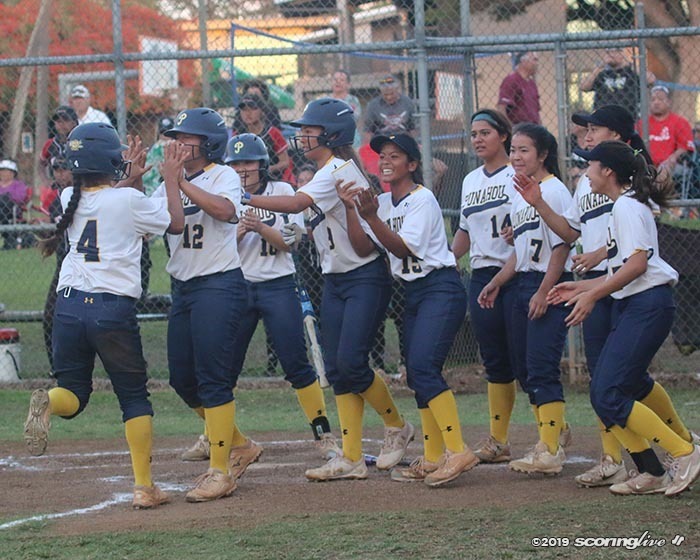 It was Punahou's first state title since 2017 and its third in four years. 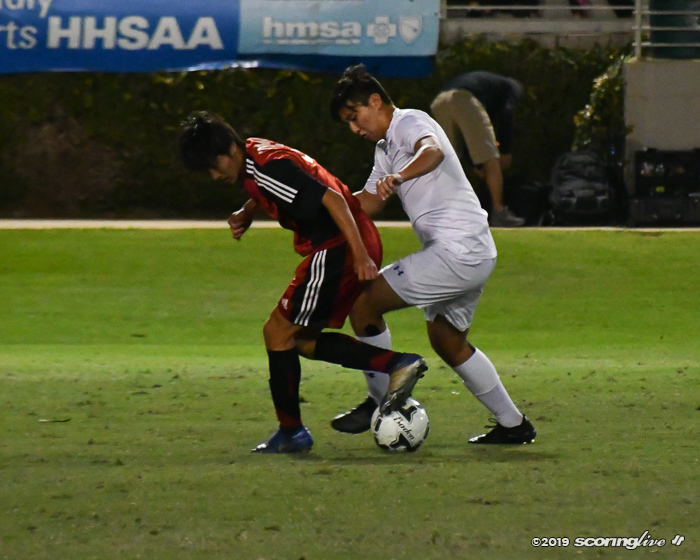 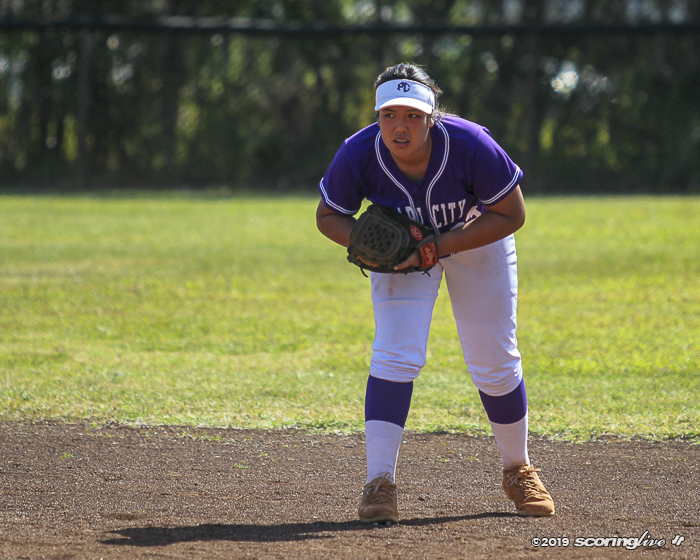 Moonier, a senior midfielder who played on the 2017 team, was ecstatic to reclaim the crown after falling short to eventual co-champion Baldwin last year in the semifinals. "This is just the icing on the cake to pull it off," he said. 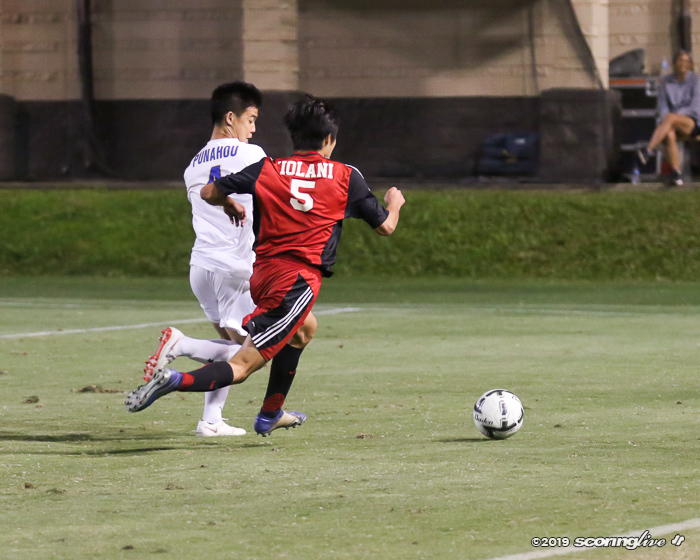 "Iolani played a great game. 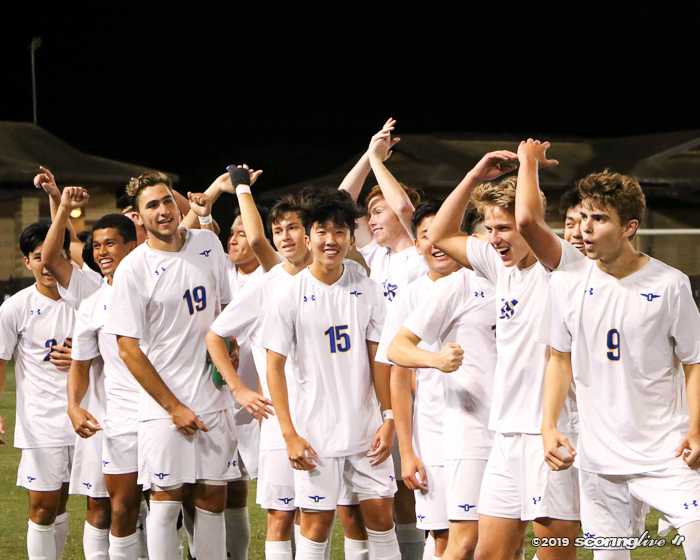 They played to the end. 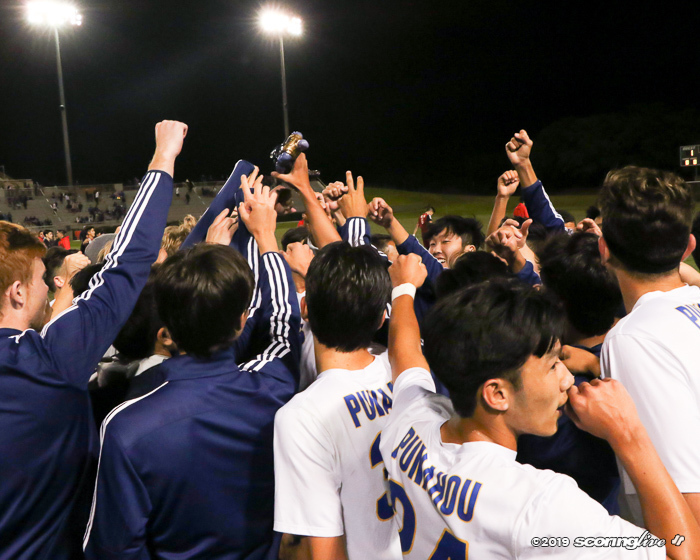 We just wanted it a little bit more." 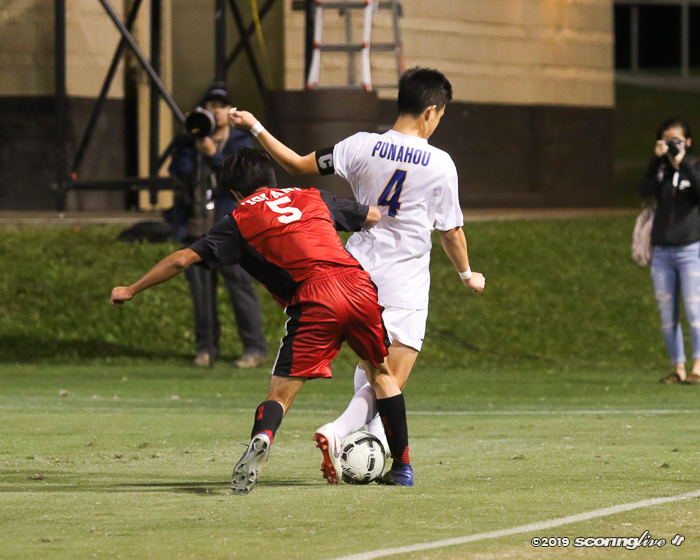 It was the fourth meeting between the two teams this season. 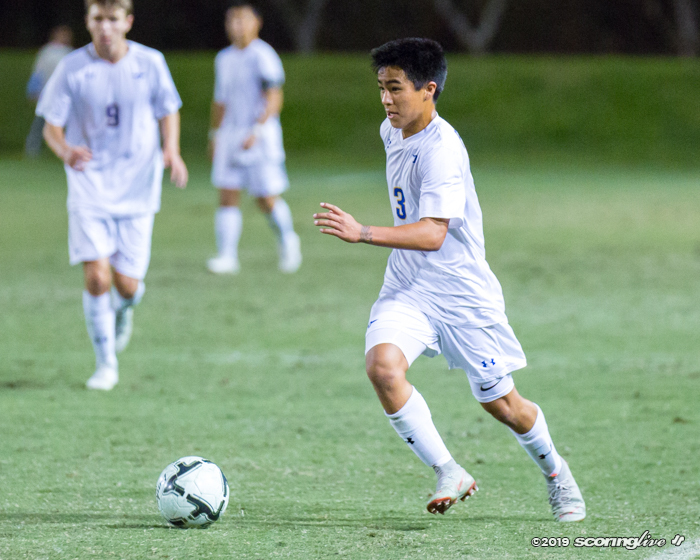 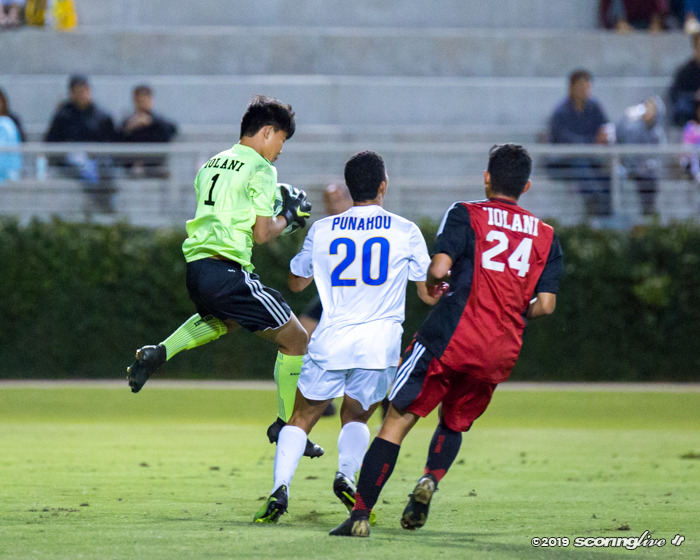 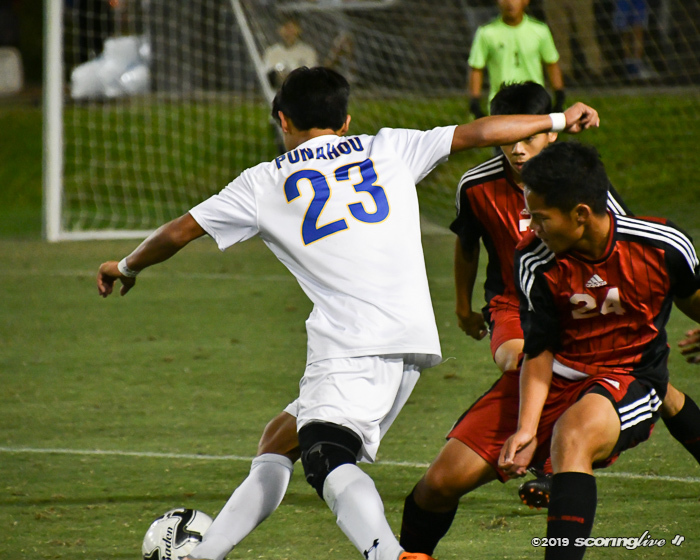 Punahou beat Iolani twice before Saturday with a 1-0 win in the season opener and a 4-1 blowout in the ILH D1 championship game. 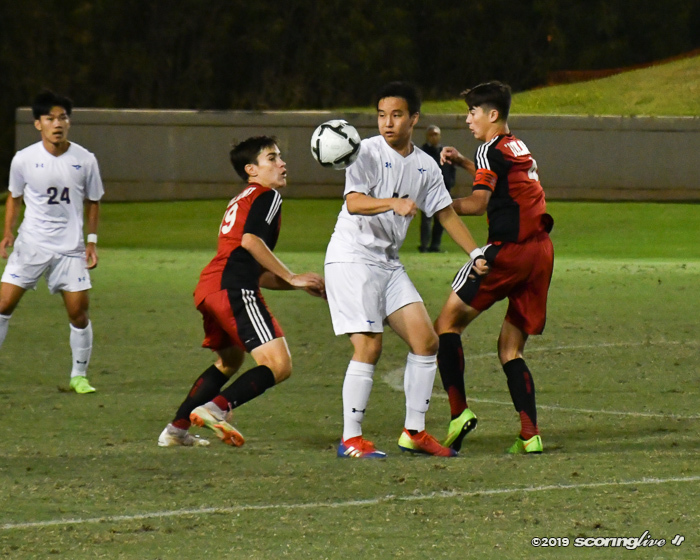 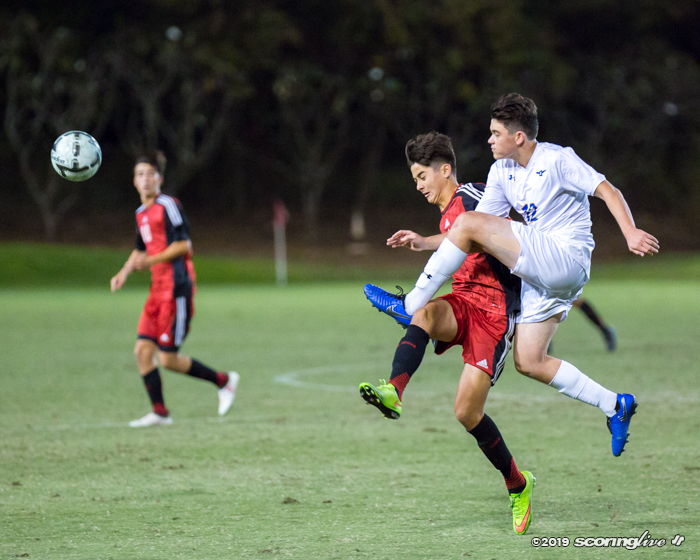 The two teams did play to a 2-2 draw on Jan. 19, but it was a contest that saw the Buffanblu rally from a 2-0 halftime deficit that ultimately helped them win the league's first round title. 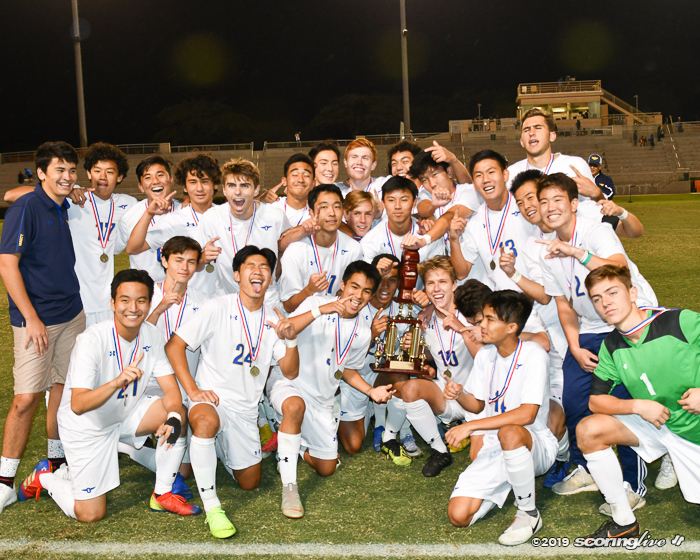 Punahou coach David Trifonovitch, who won his fifth state title with the Buffanblu, was thrilled to get the win over a Iolani team that has improved over the course of the season. 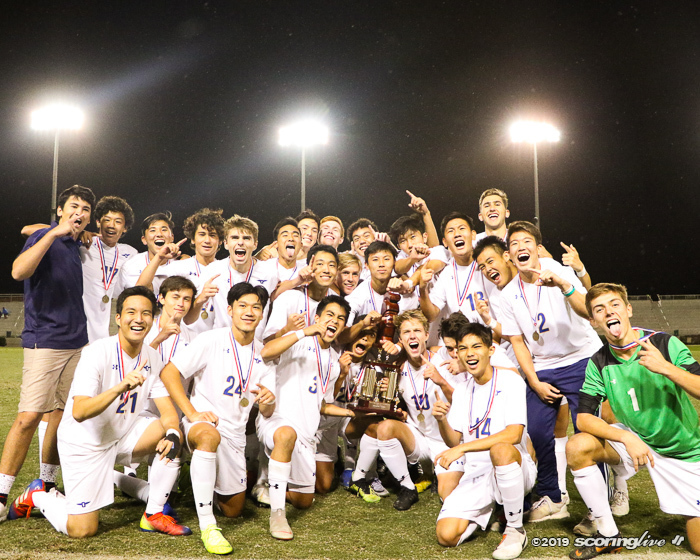 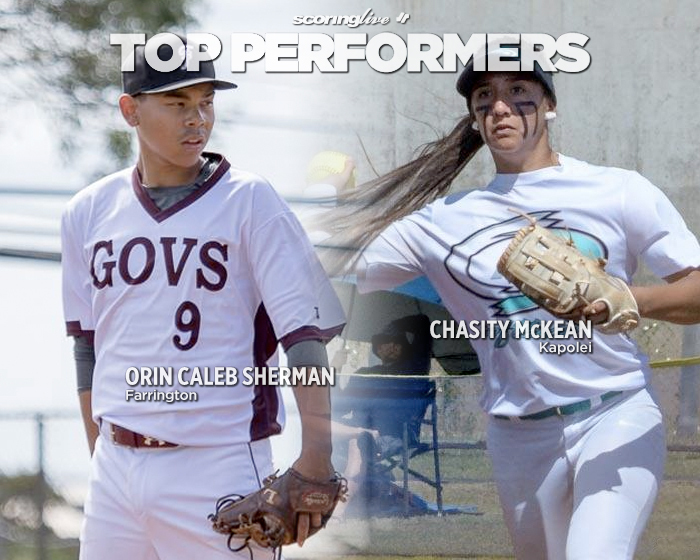 "They just got better and better and better and they really peaked in the state tournament, so hats off to their coaches and what they've done with their players over the season because they're a way different team now today, than they were at the beginning," Trifonovitch said. 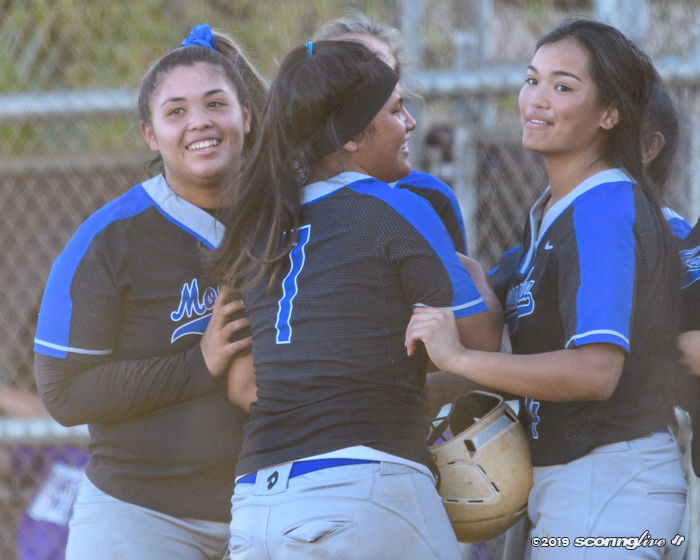 "We kind of stayed the same so we had to kind of maintained and stuff so for us to come out with this with the win is huge. 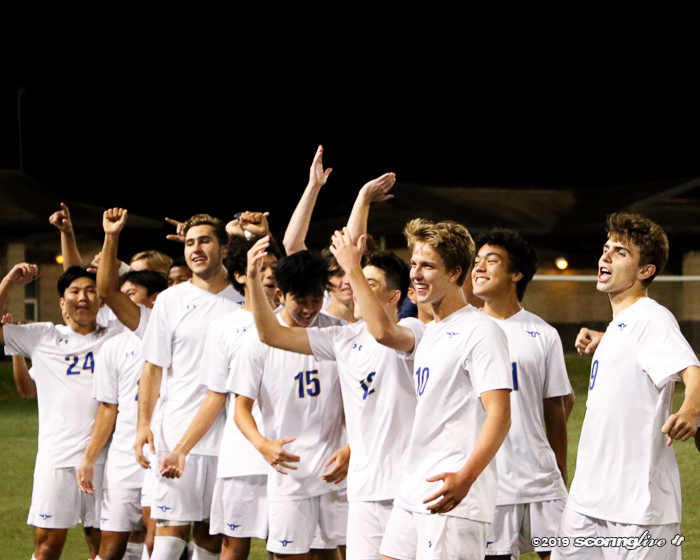 Hats off to them because that game could have gone anywhere at any minute, luckily it went our way." 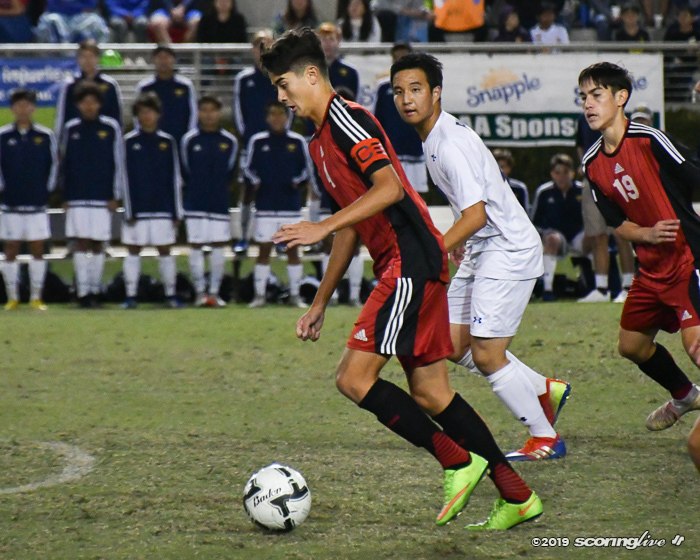 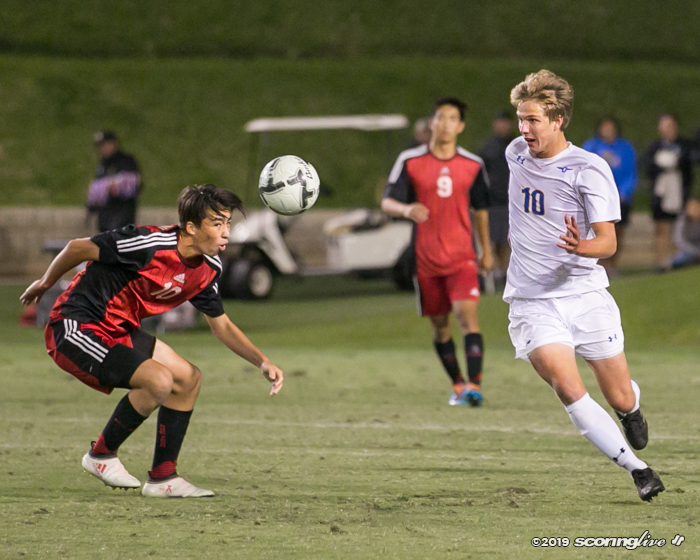 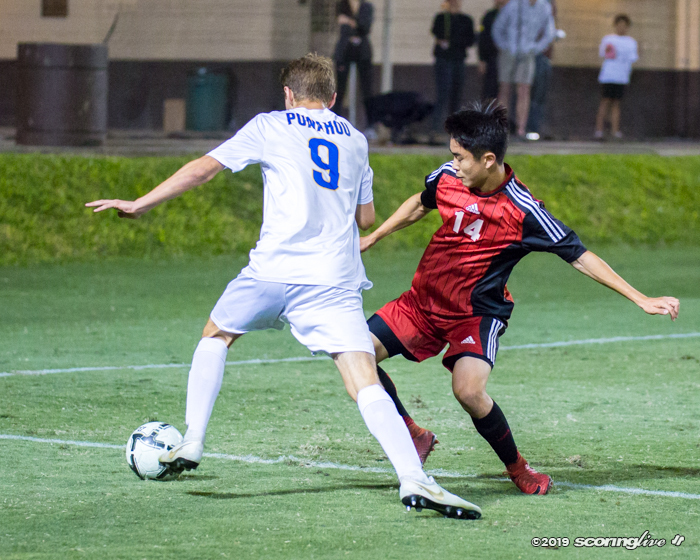 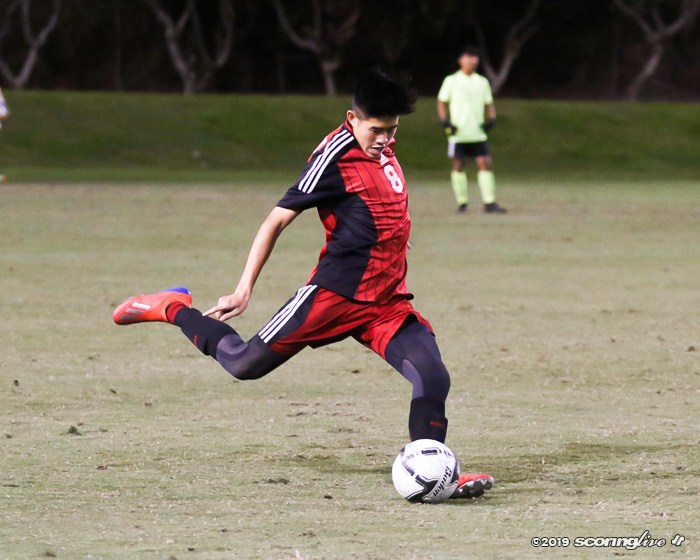 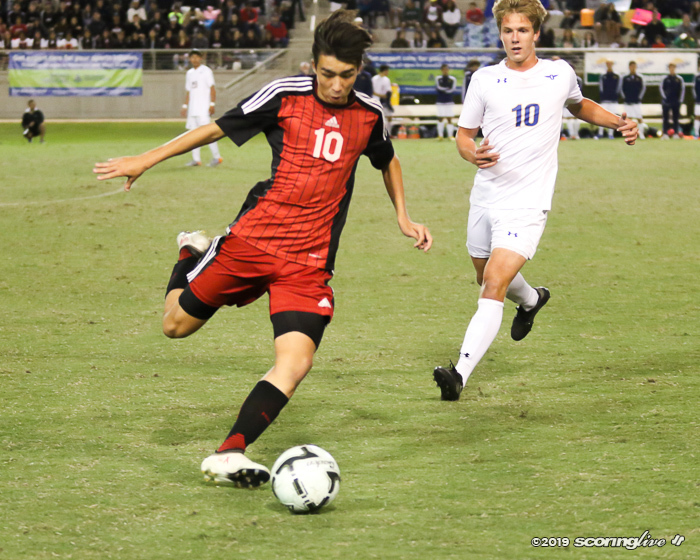 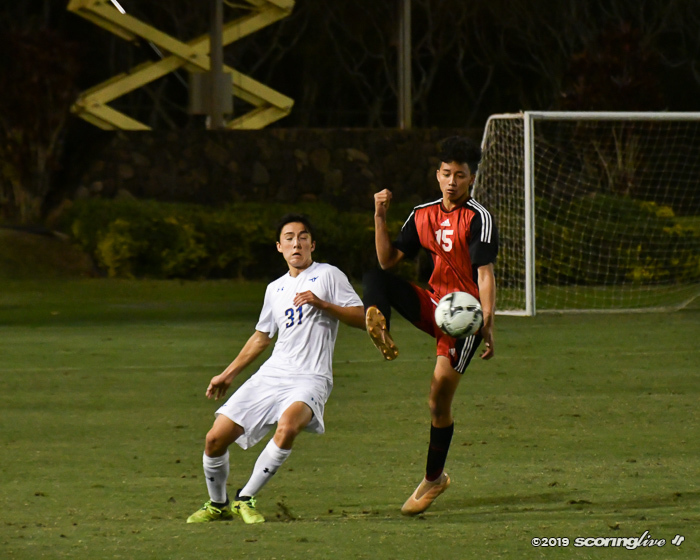 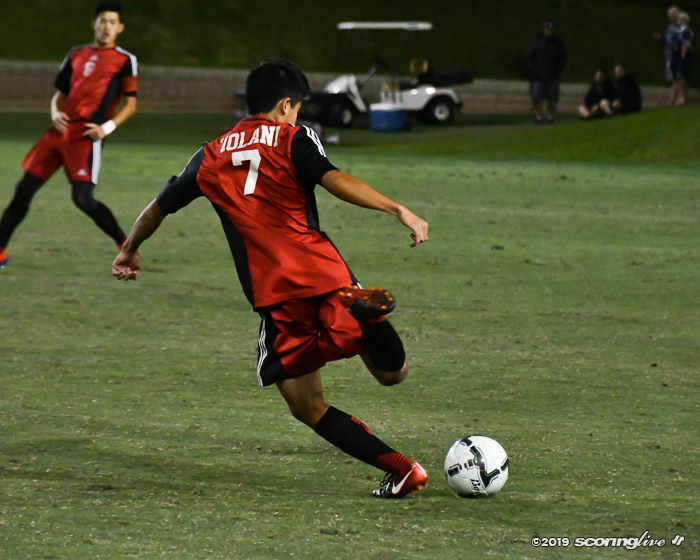 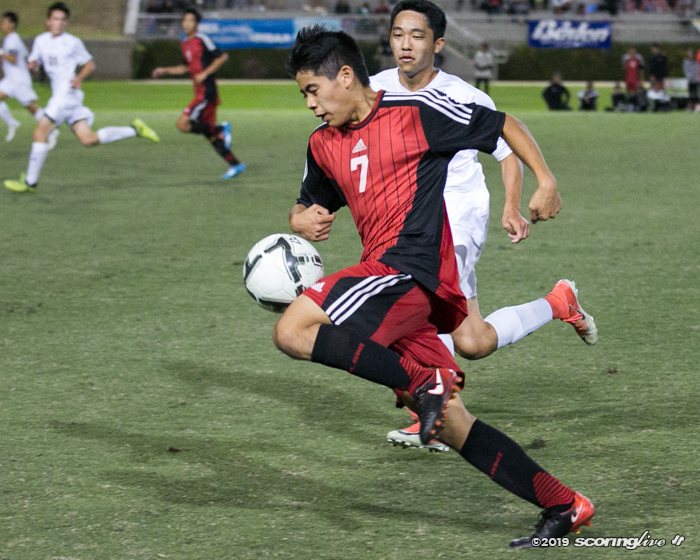 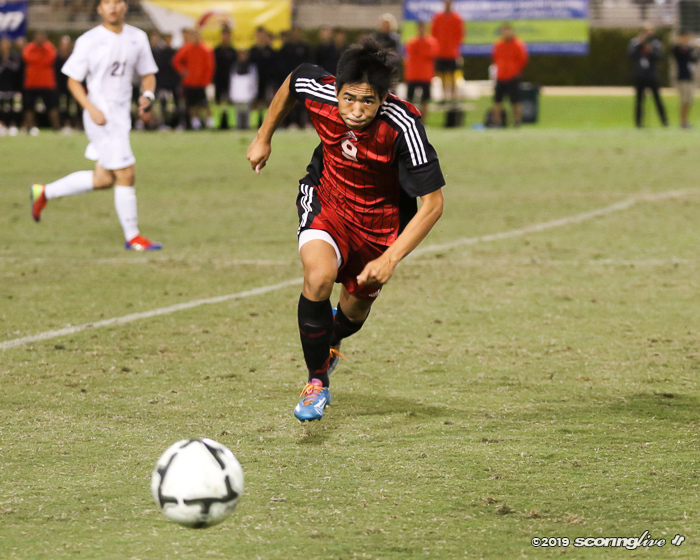 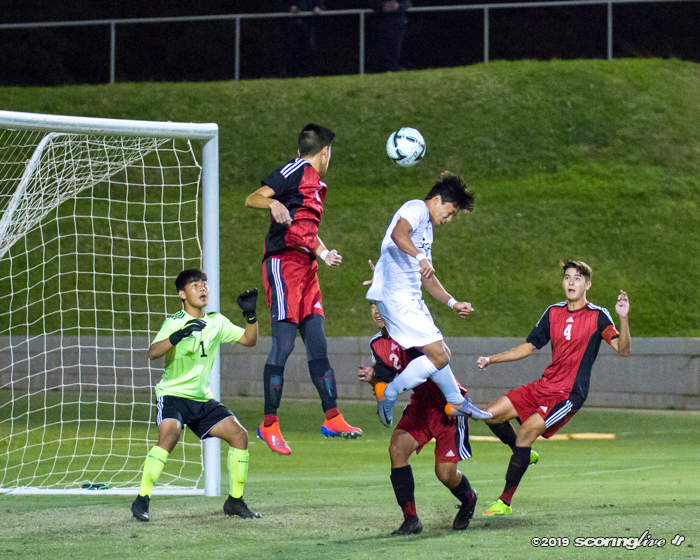 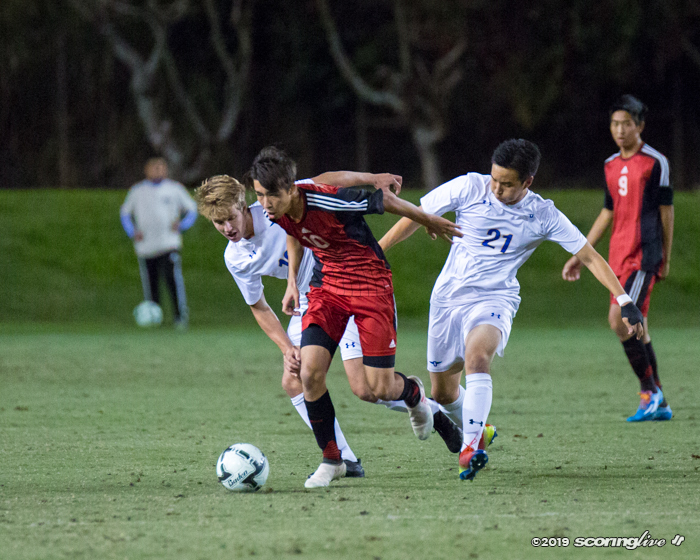 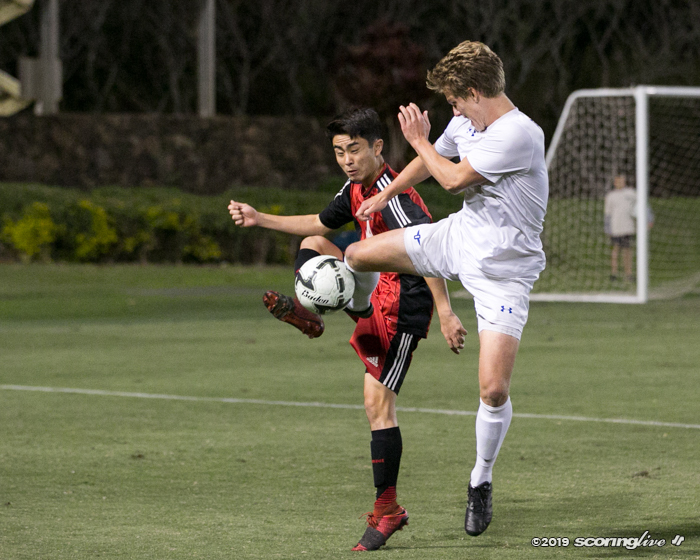 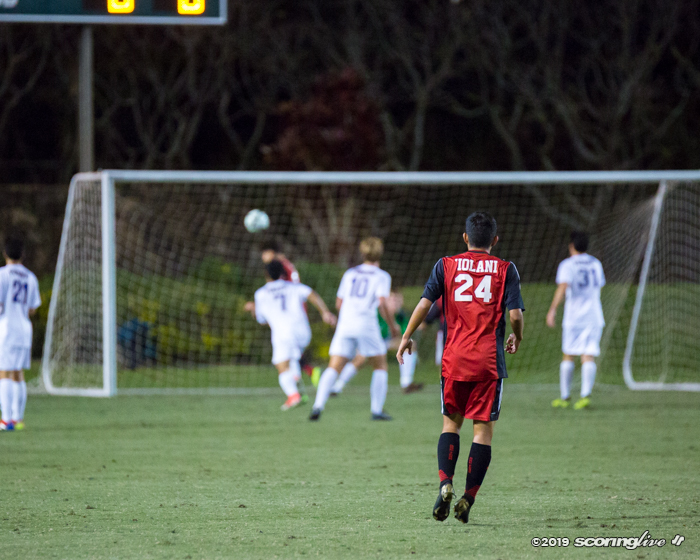 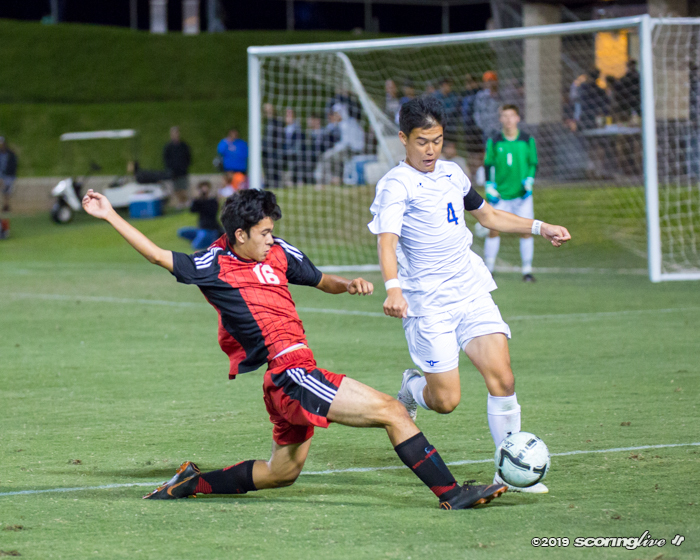 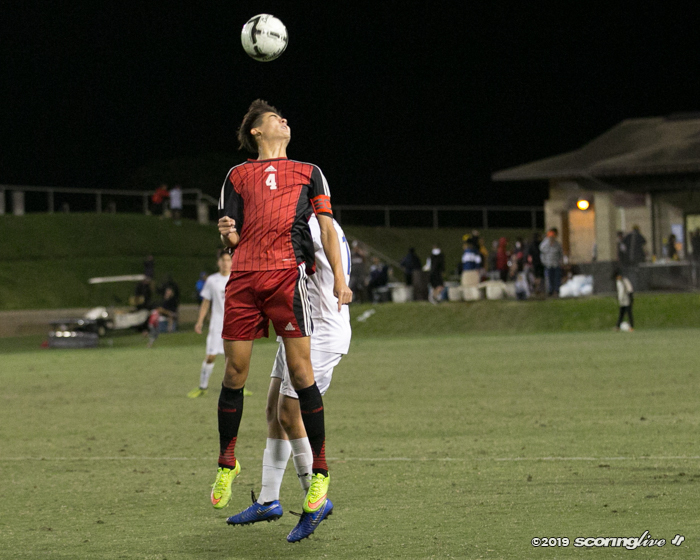 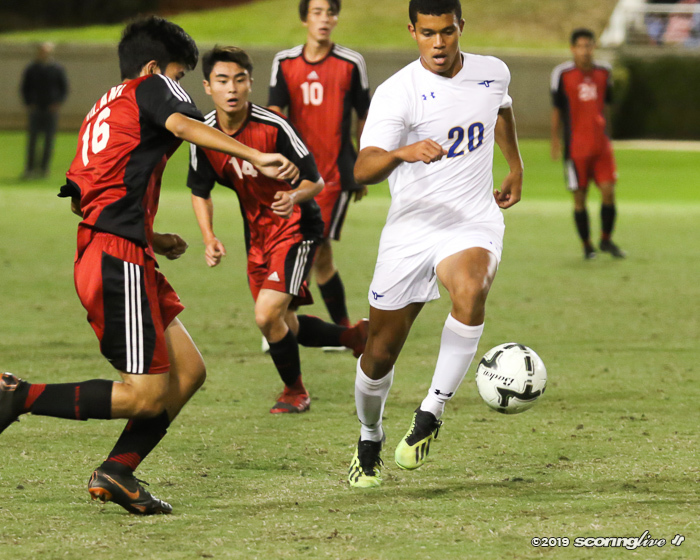 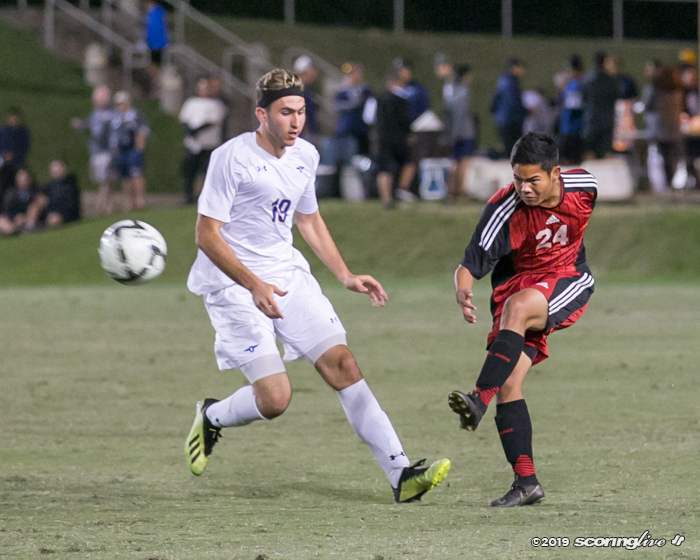 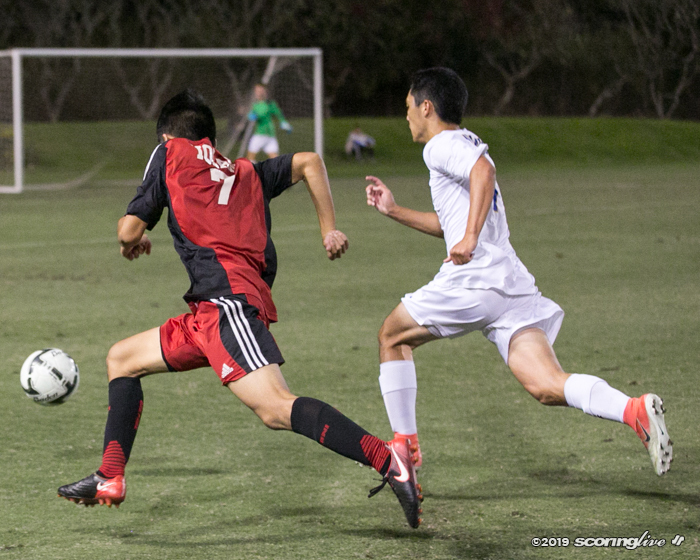 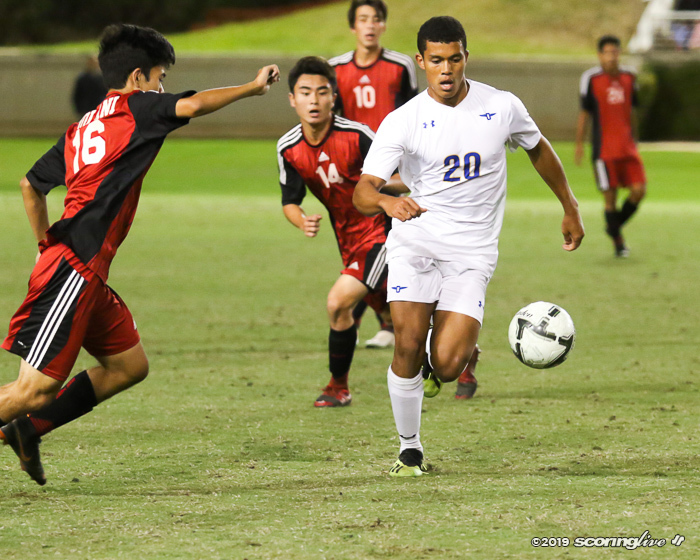 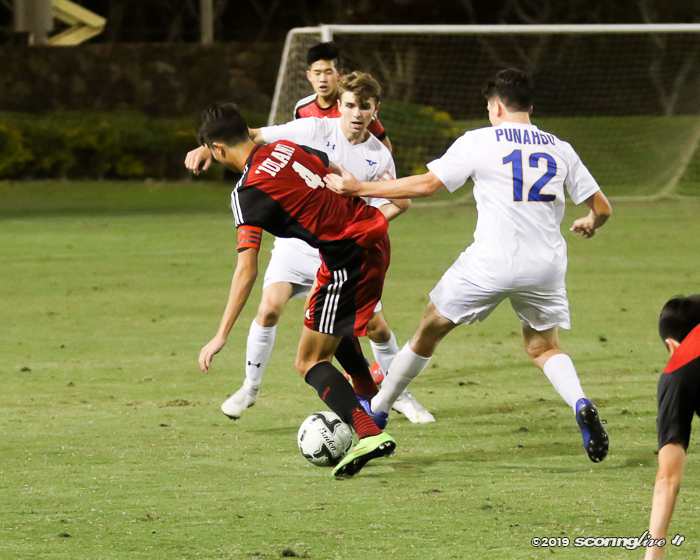 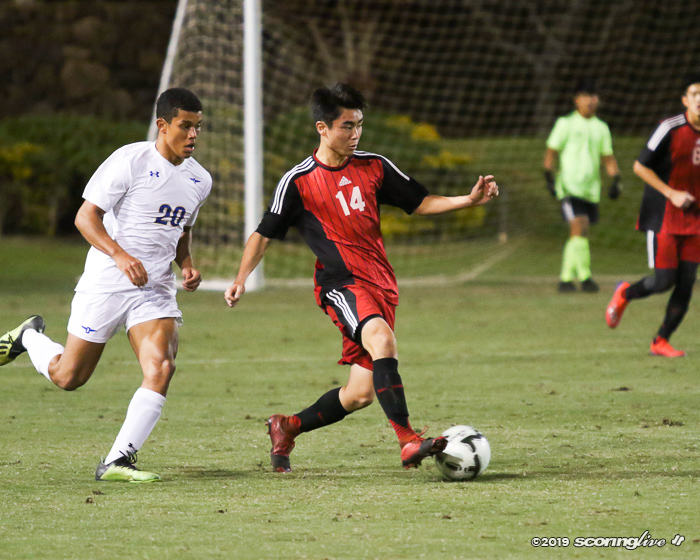 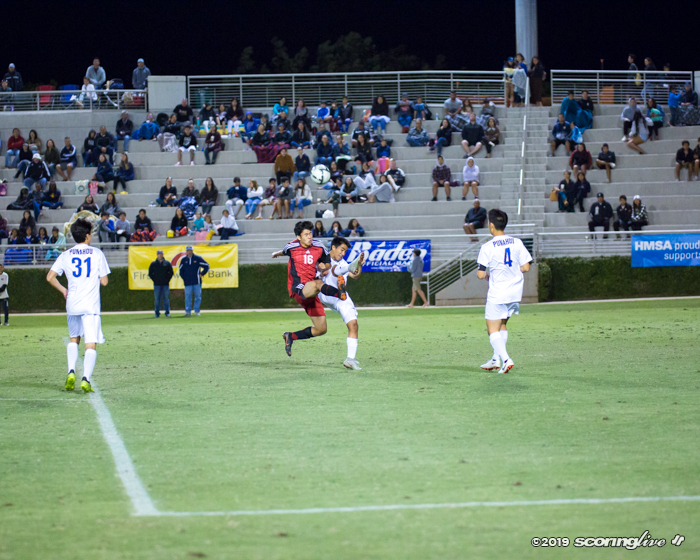 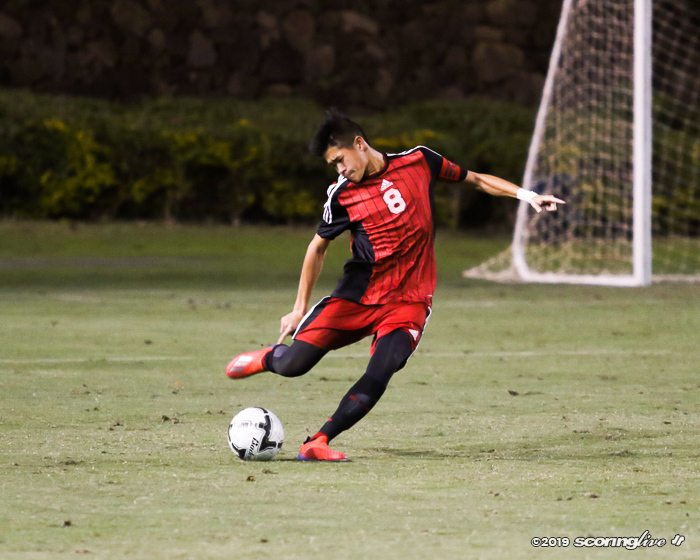 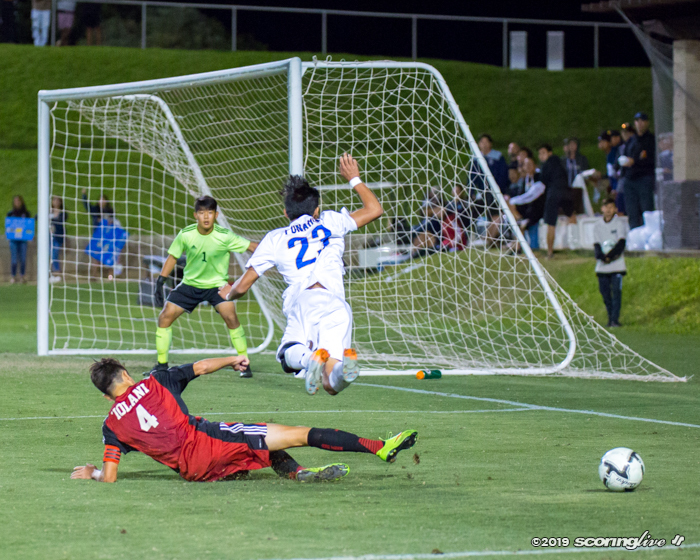 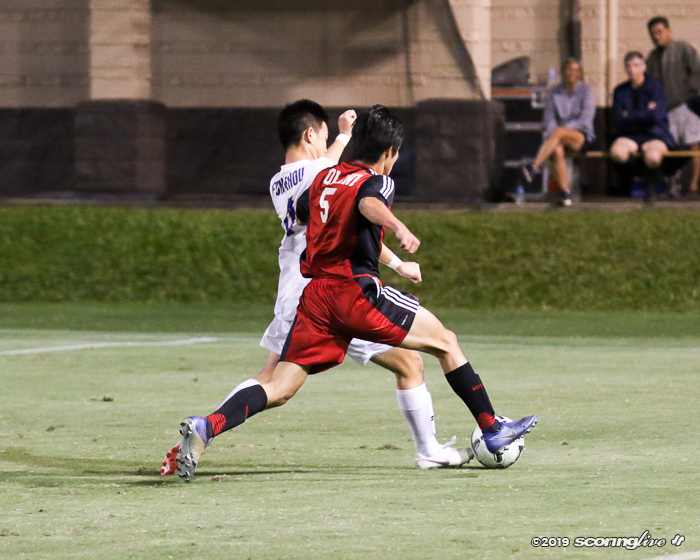 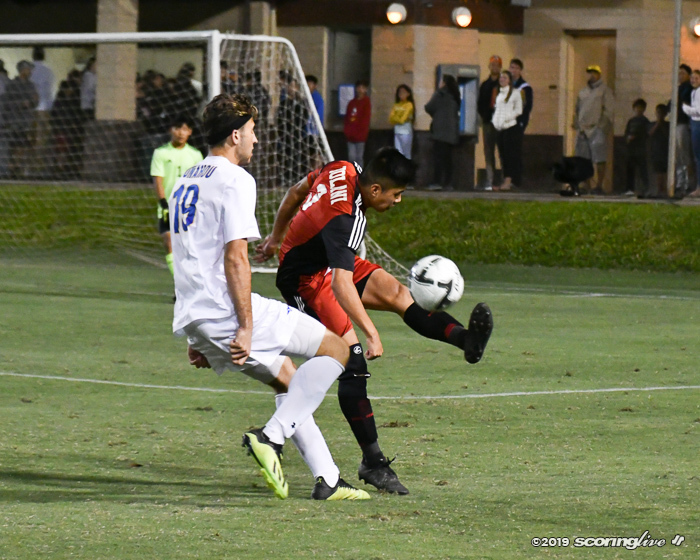 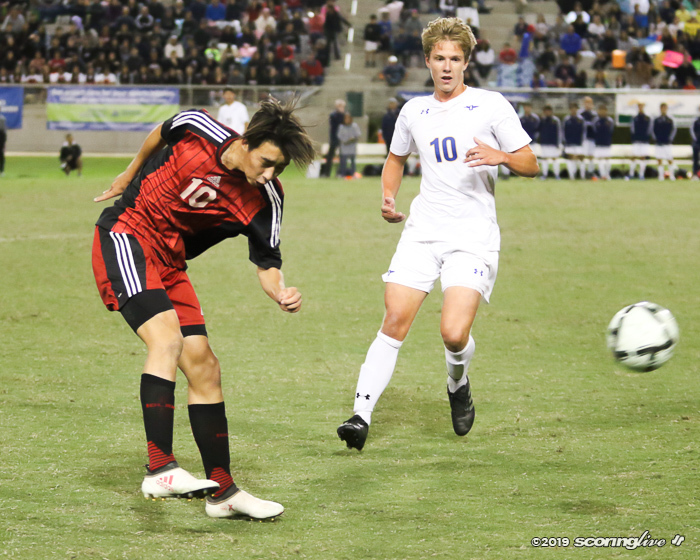 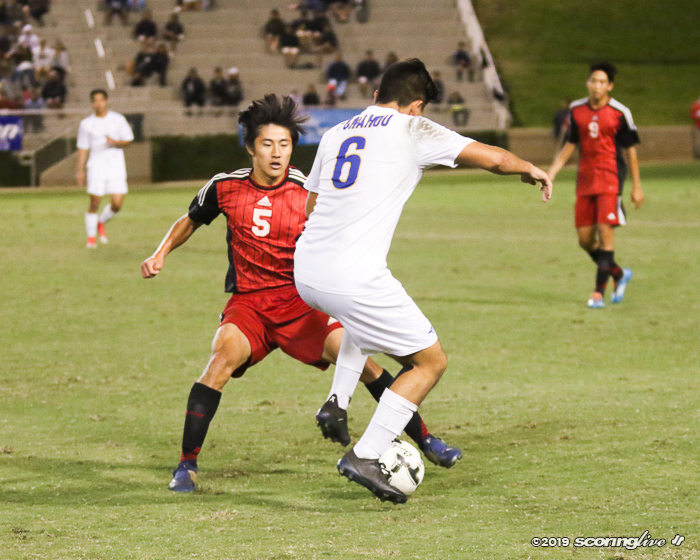 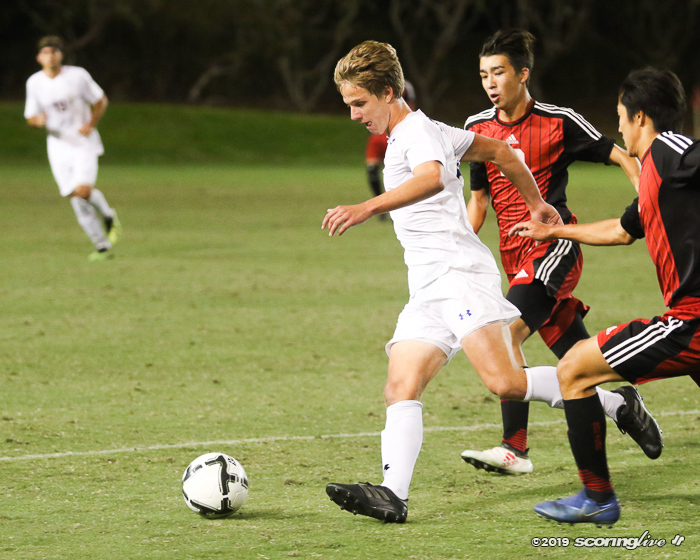 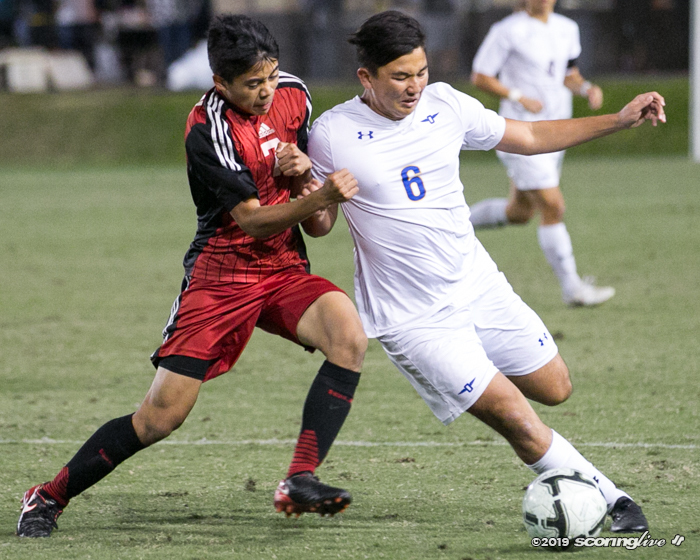 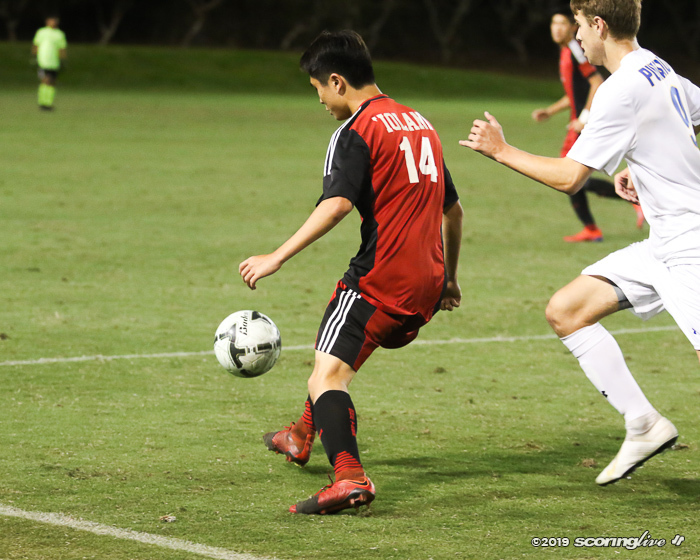 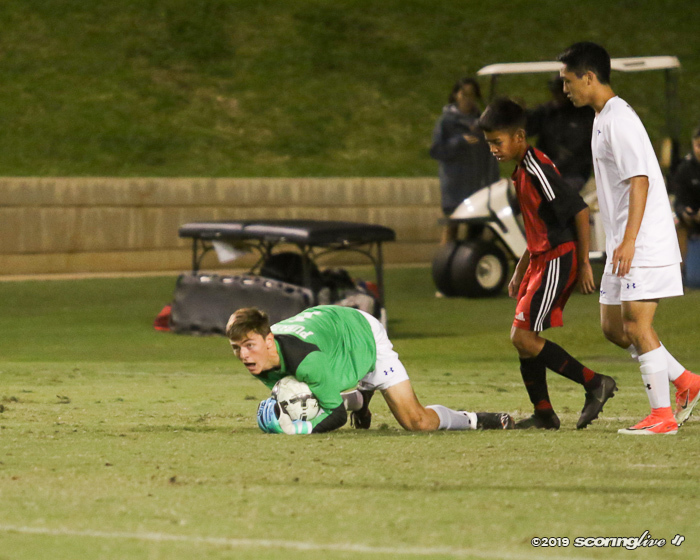 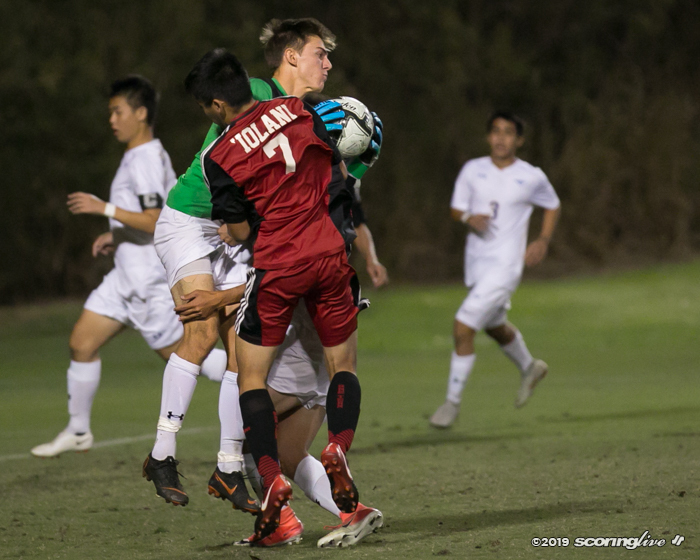 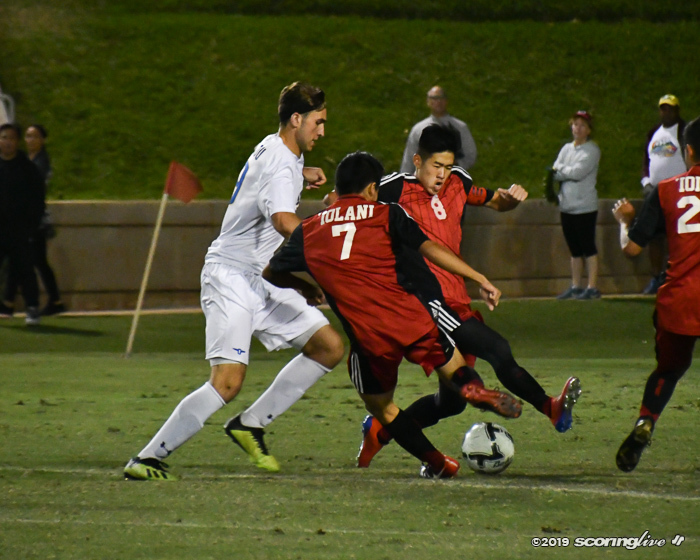 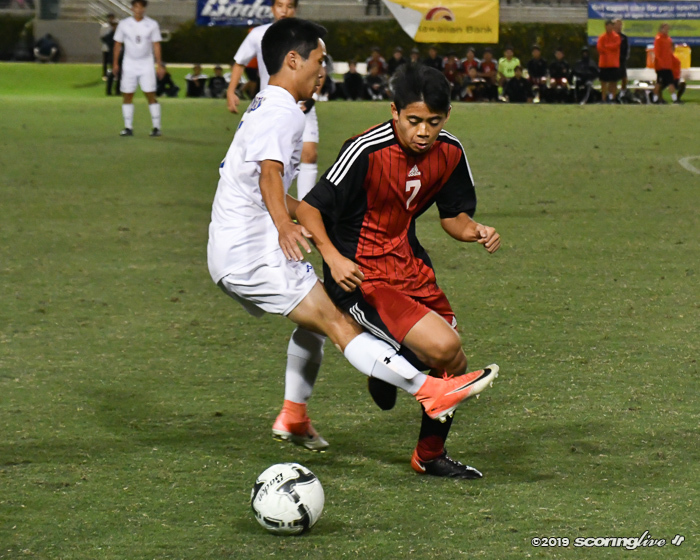 The game-winning goal by Moonier was a result of an Iolani miscue. 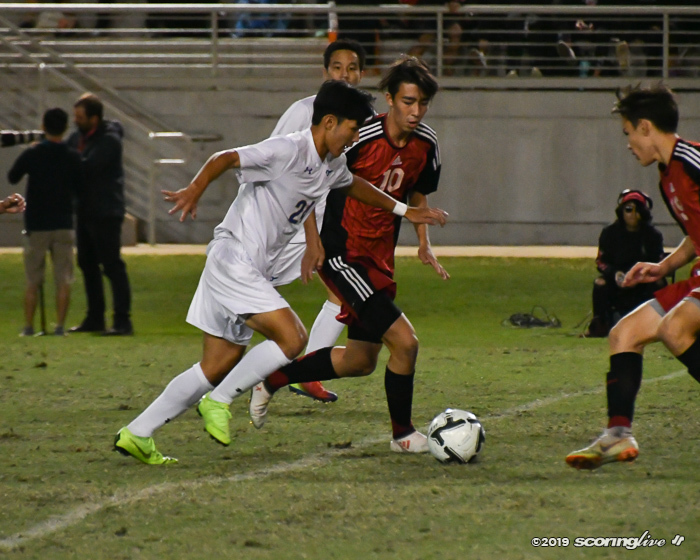 The Raiders tried to clear the ball, but it ricocheted towards Moonier from about 18 yards out. 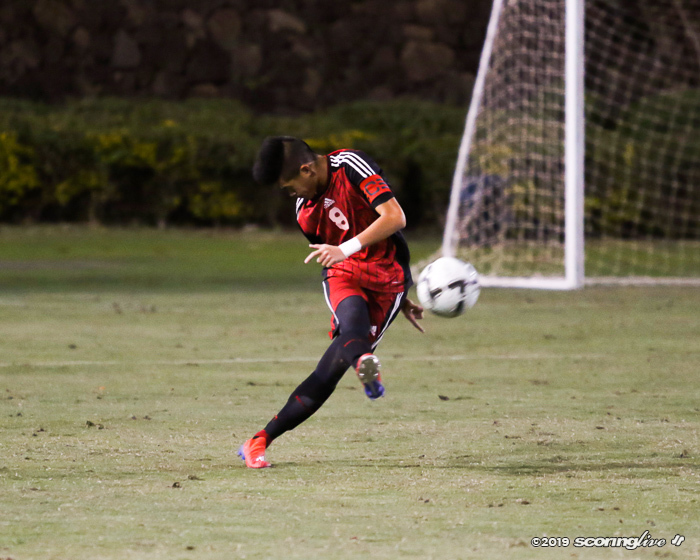 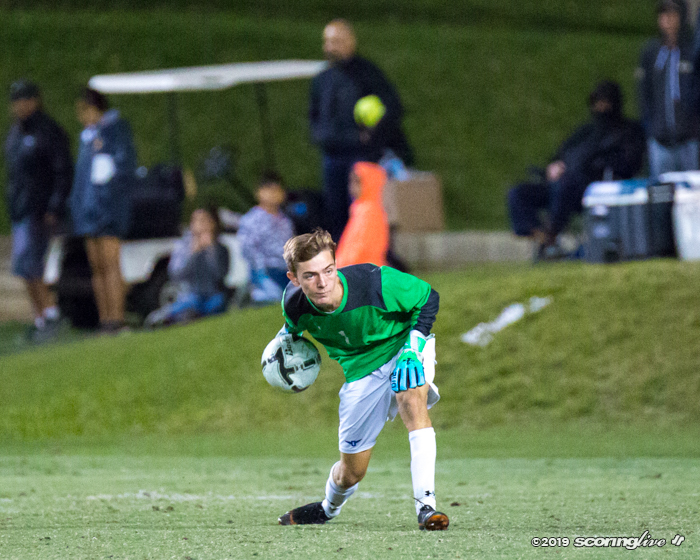 After reading the ball's bounce, Moonier lobbed the game-winner in between the Iolani keeper's head and the crossbar. 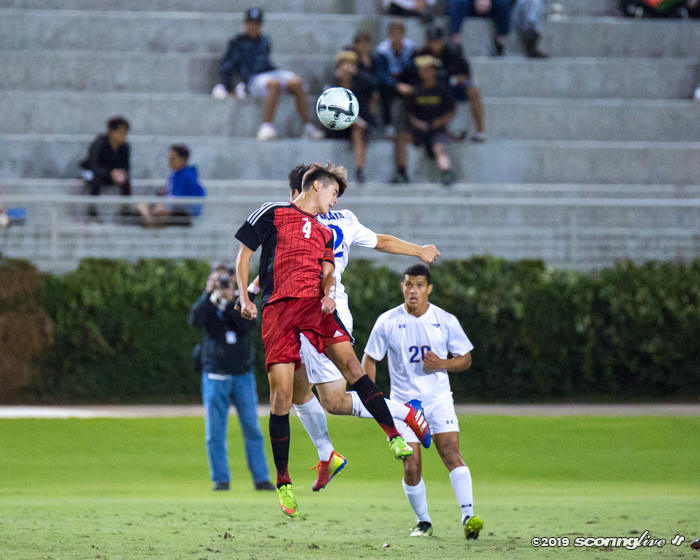 "I just saw the ball coming down off a bad clearance. 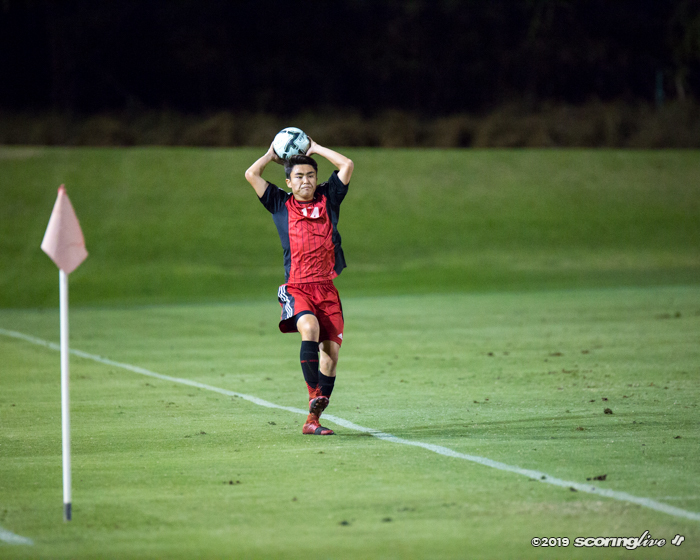 It's just one of those things I felt like I've done before. 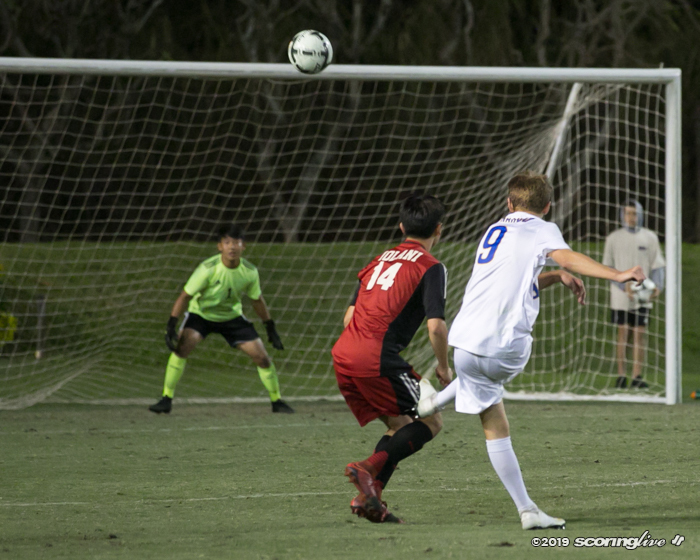 I saw it coming, and I knew it was a goal right when I struck it," said Moonier. 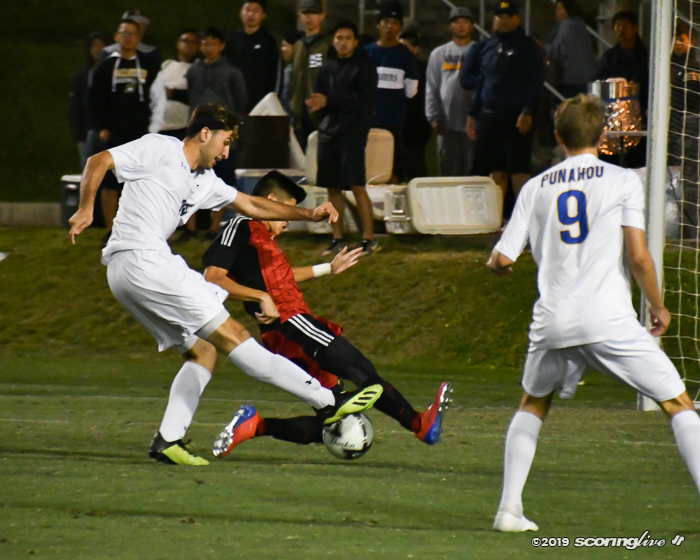 Trifonovitch said Moonier's goal validated all of the hard work that the veteran player has put in throughout his career. 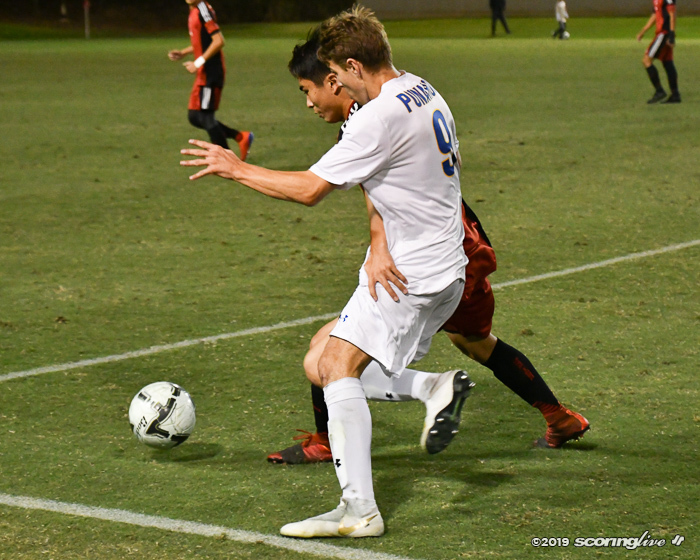 "Beautiful goal, I was just ‘wow,' that's all I could say, but it's so meaningful I think in that situation because Max, he's been stellar for us for three years and this year, being a senior, there's more pressure. 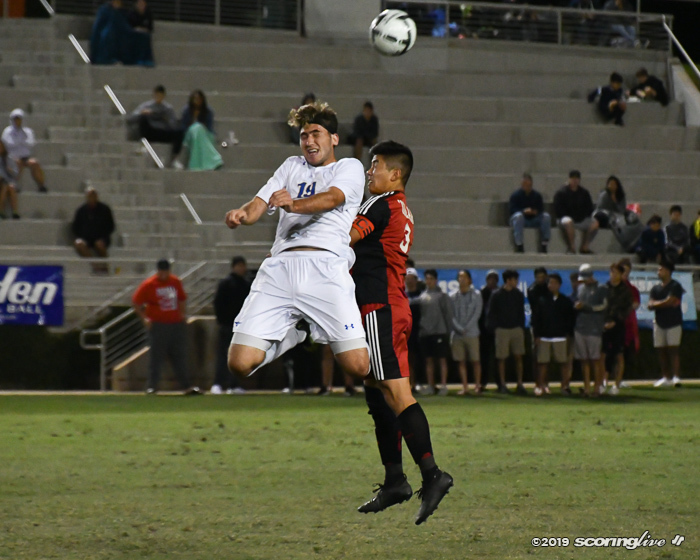 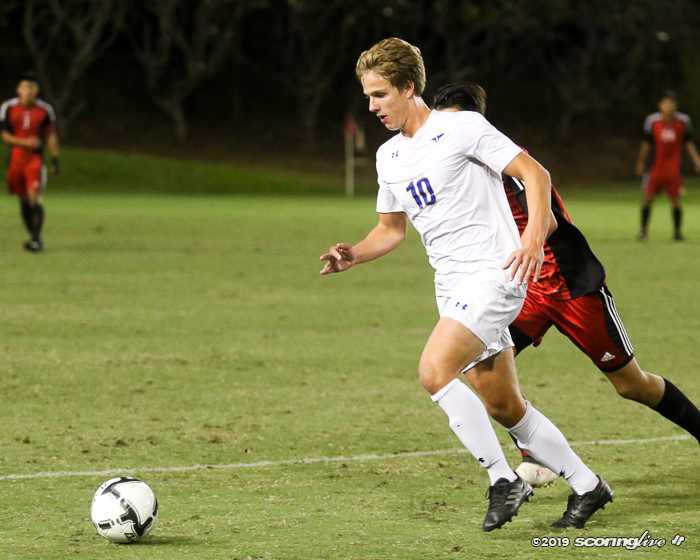 He wasn't playing as well as he did last year and the year before, so for him to get the goal as the game-winner was huge," said Trifonovitch. 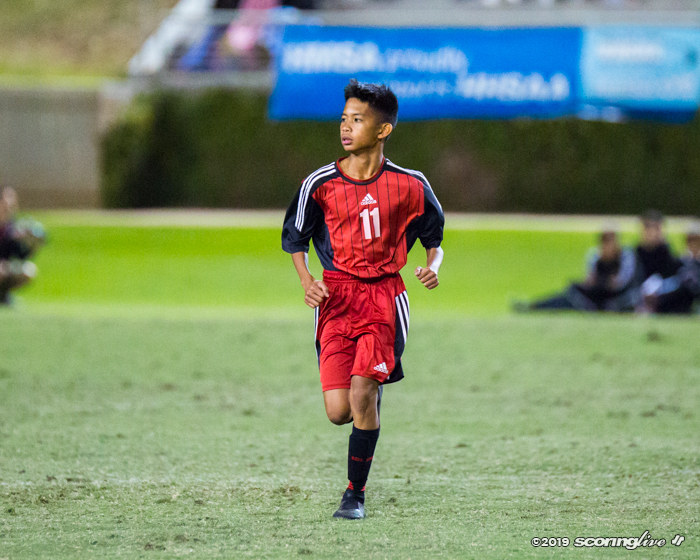 "I think it's going to make him feel so much better about his season. 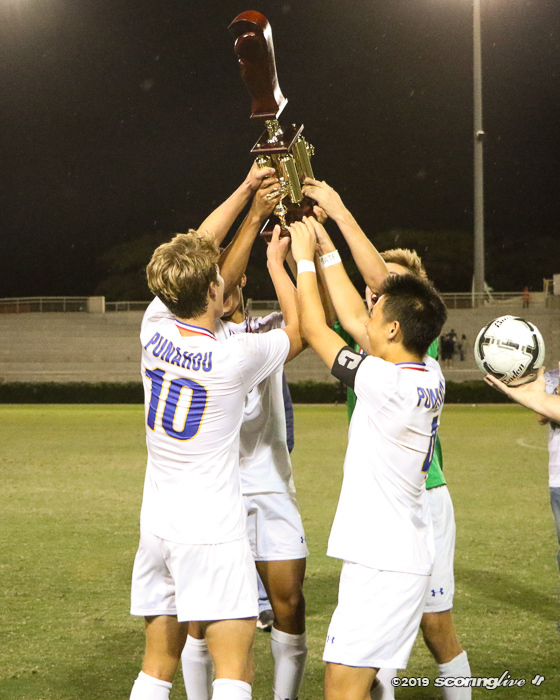 It validates everything he's done for the last three years. 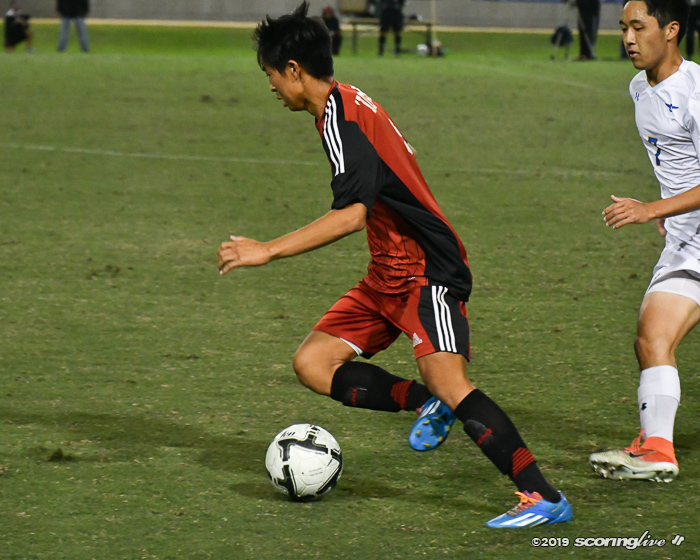 He's been one of our team leaders. 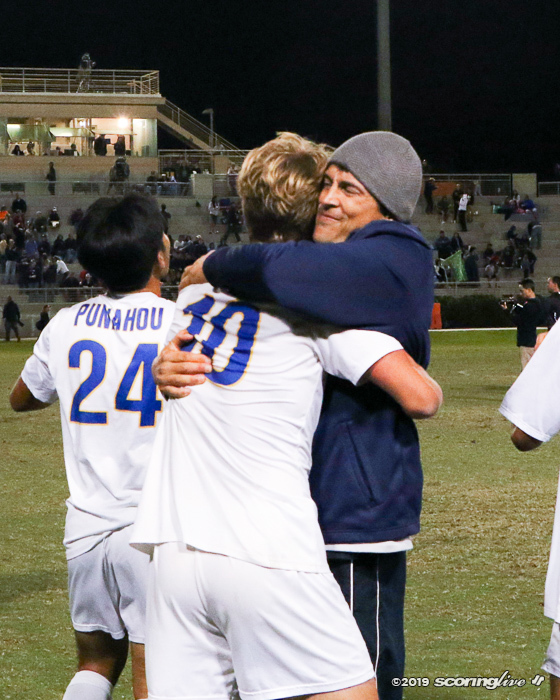 We're going to miss him." 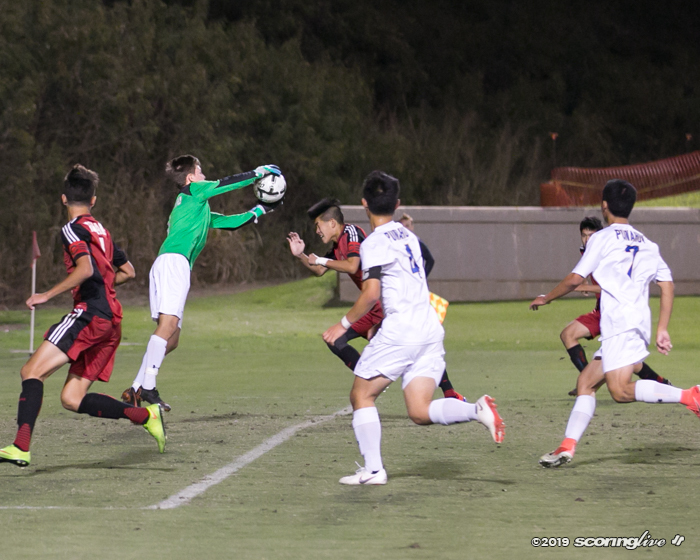 Outside of the lone score of the game, it was a tightly contested game with both teams getting good opportunities and good stops throughout the match. 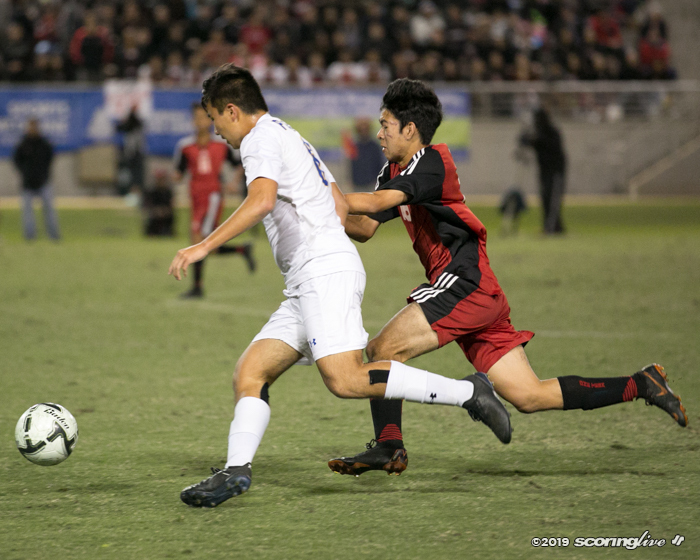 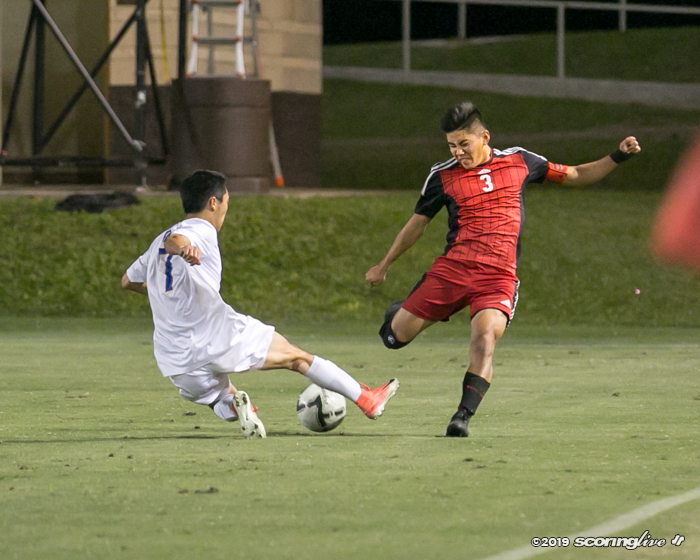 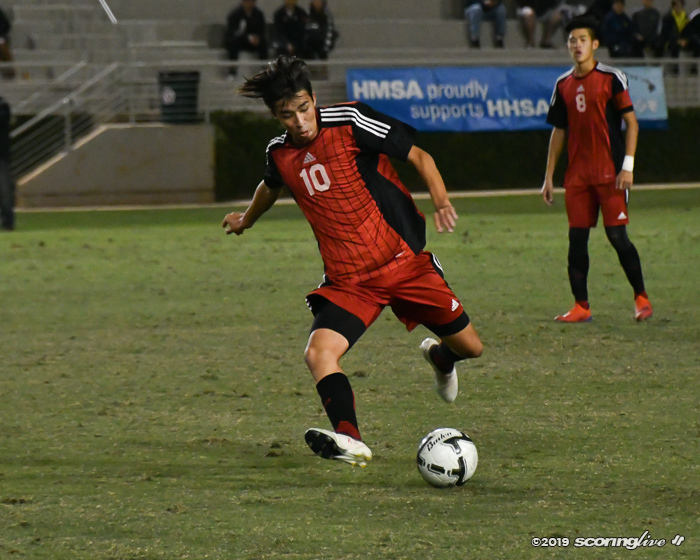 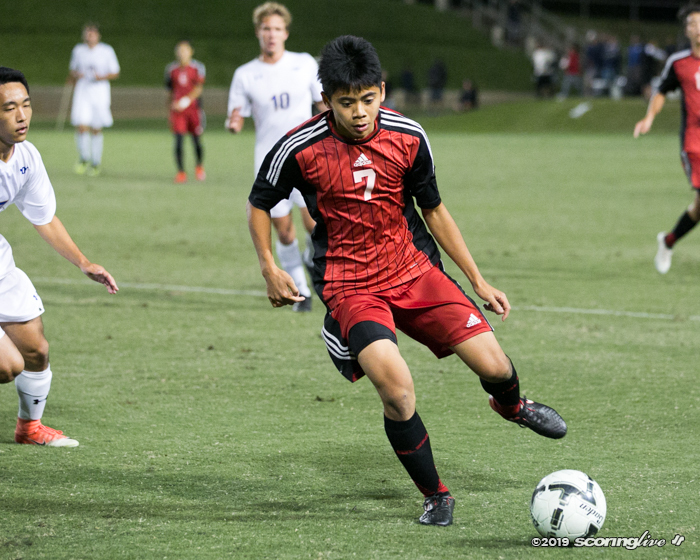 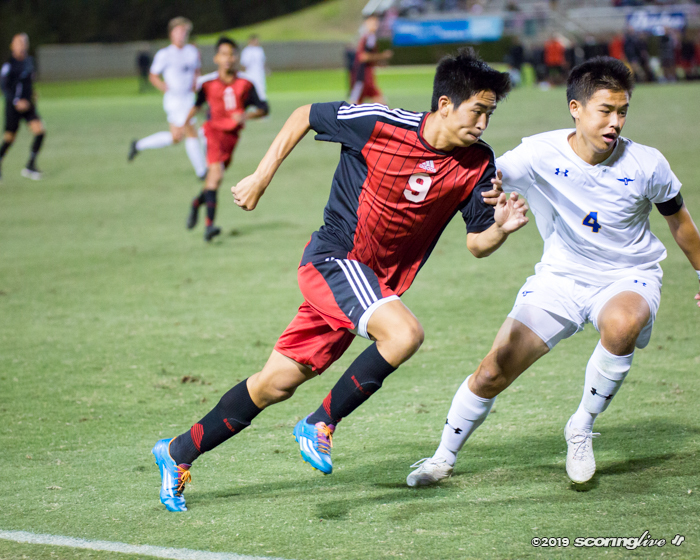 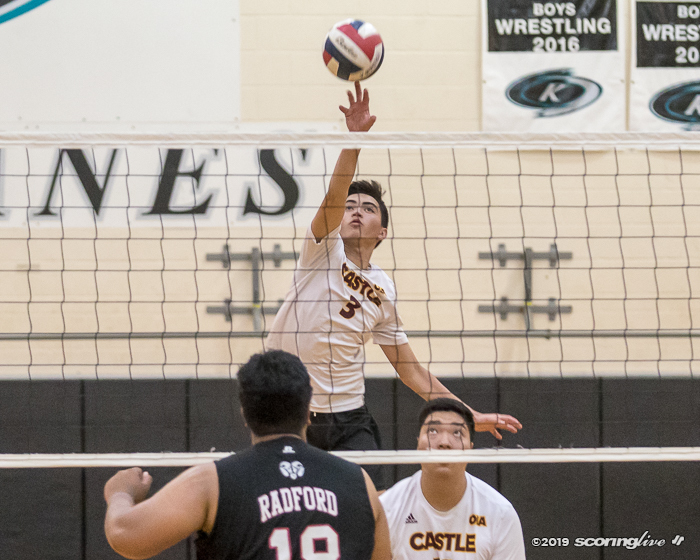 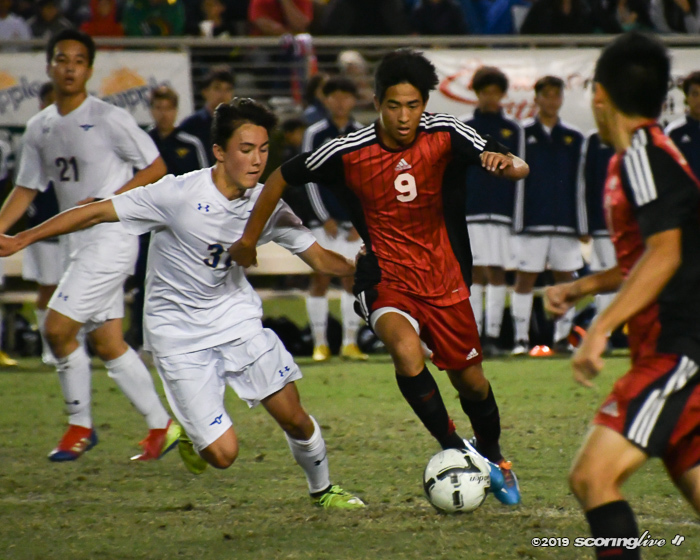 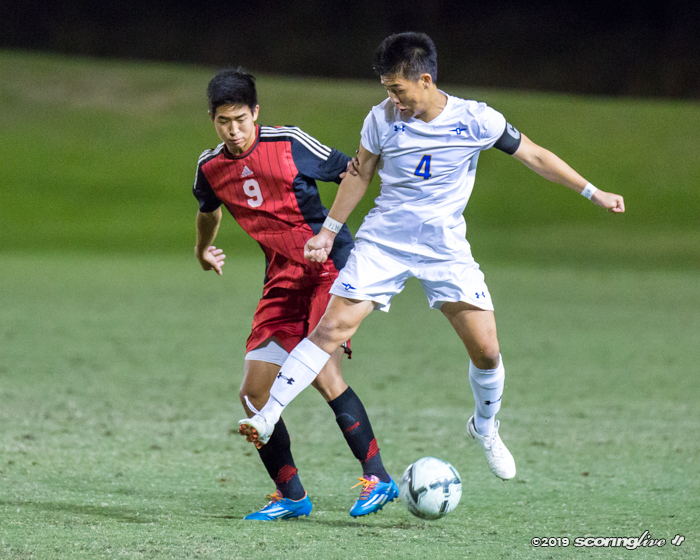 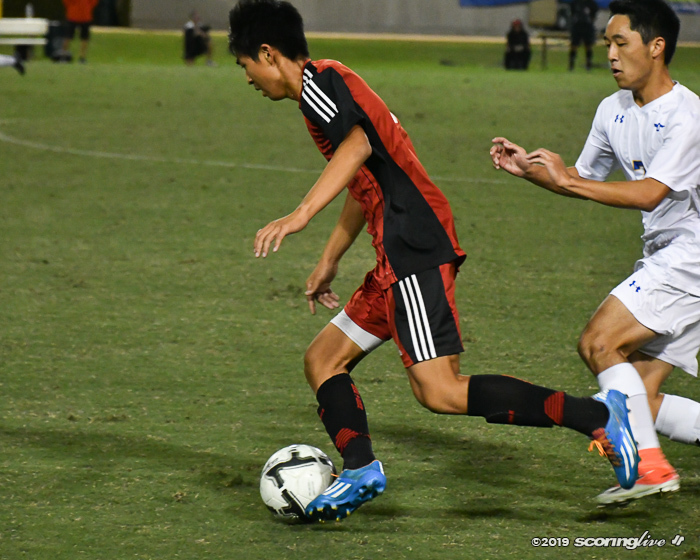 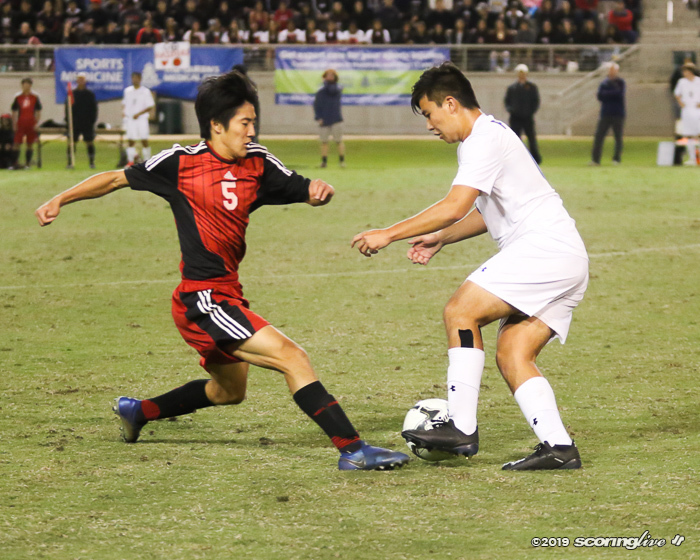 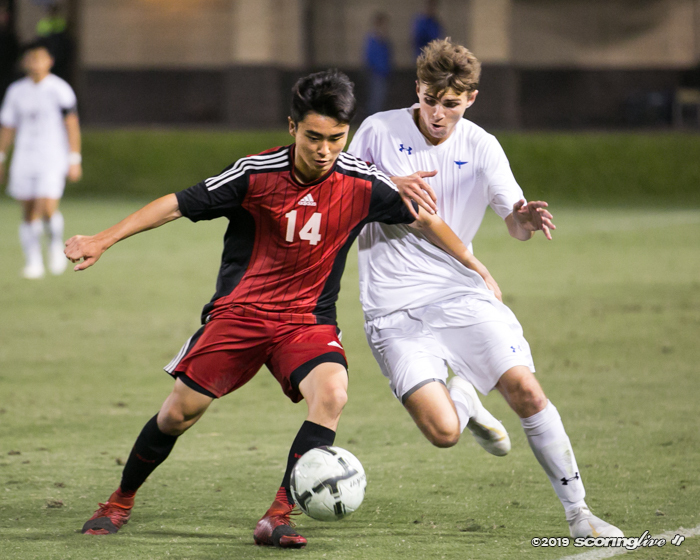 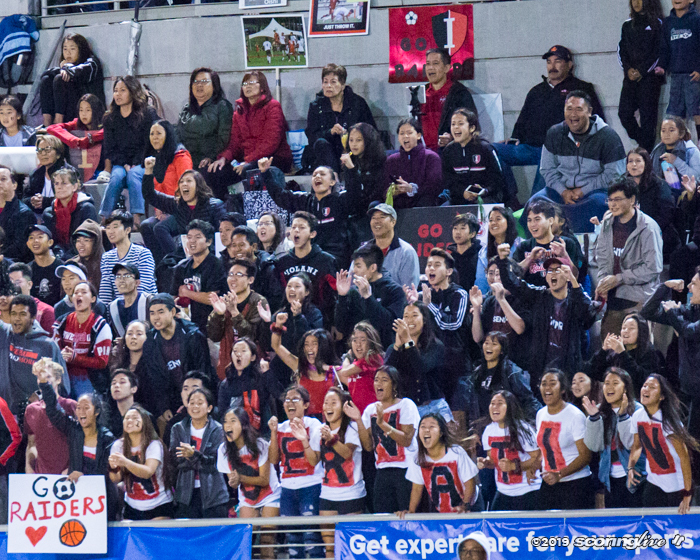 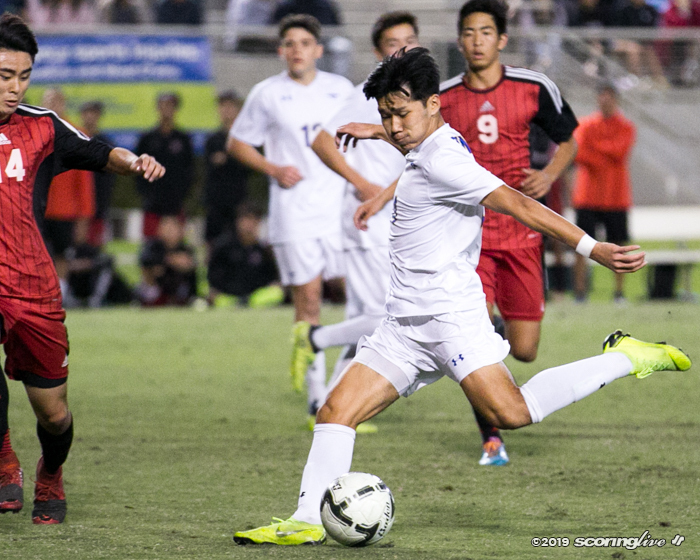 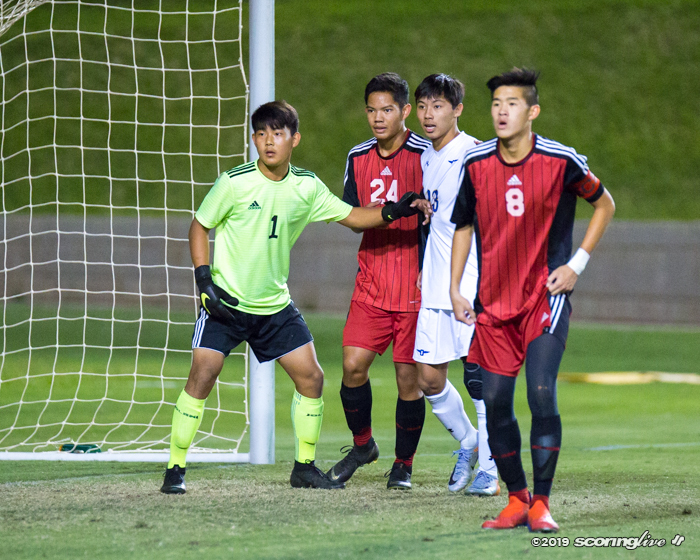 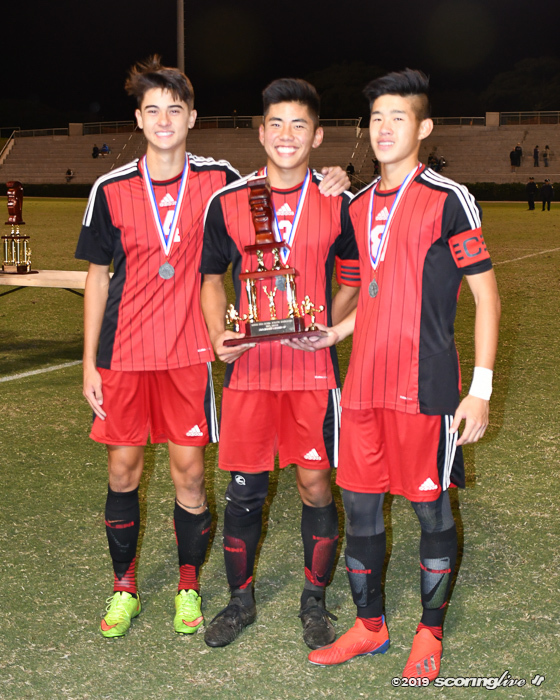 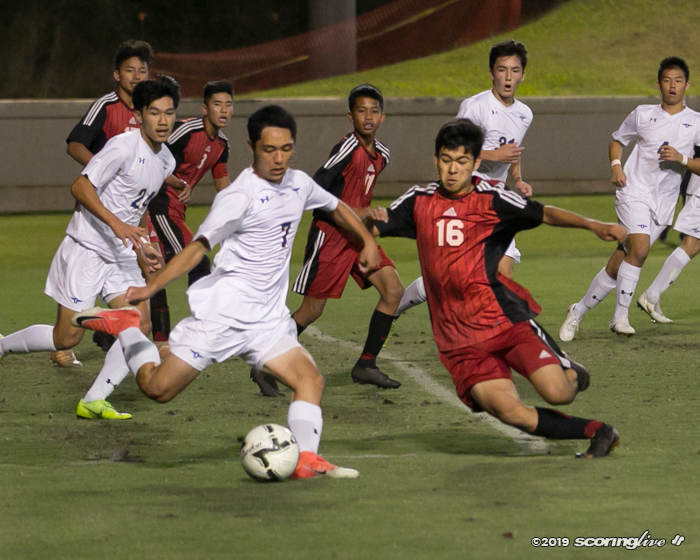 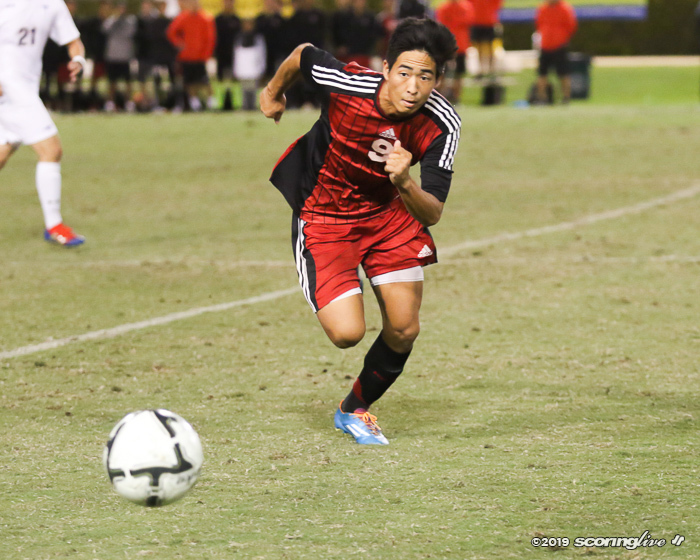 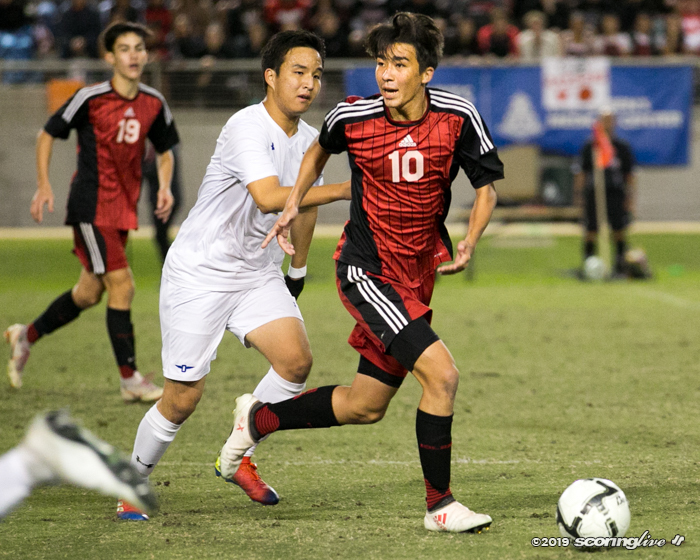 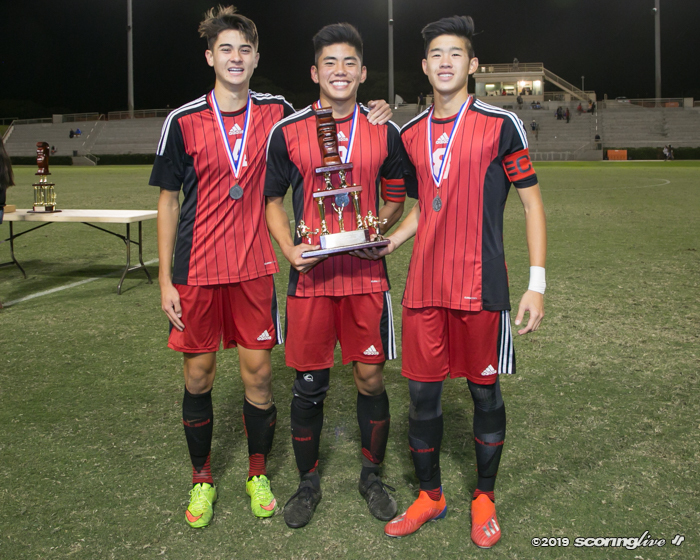 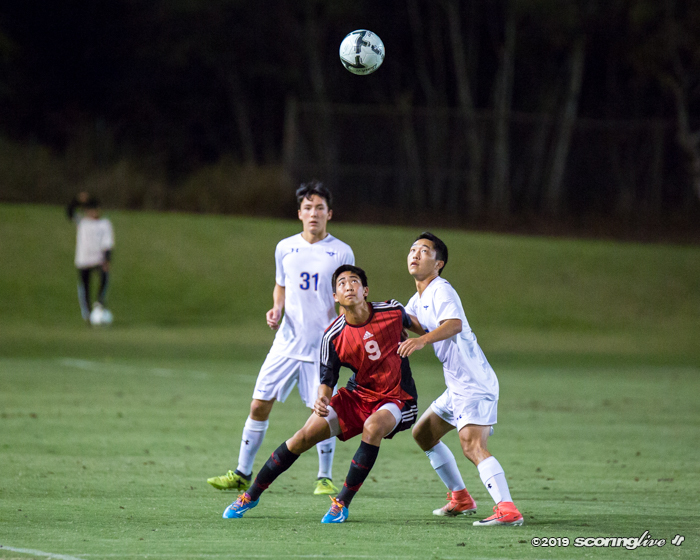 "I thought the game could have gone either way," said Iolani coach Chris Lee. 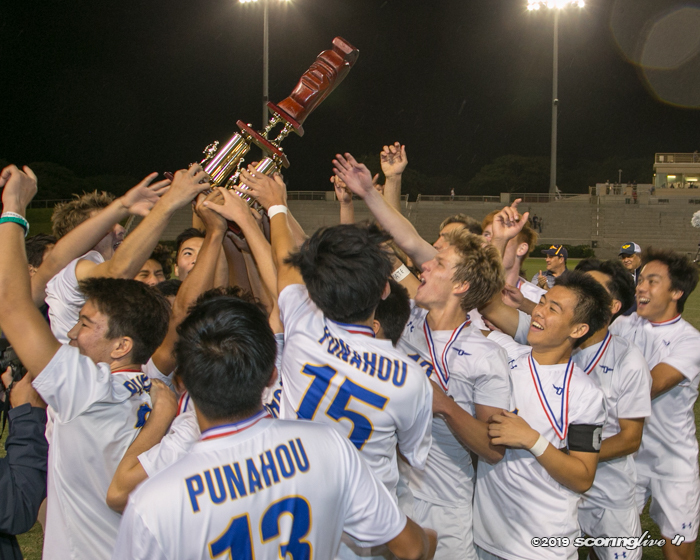 "It wasn't one team dominating for long periods of time. 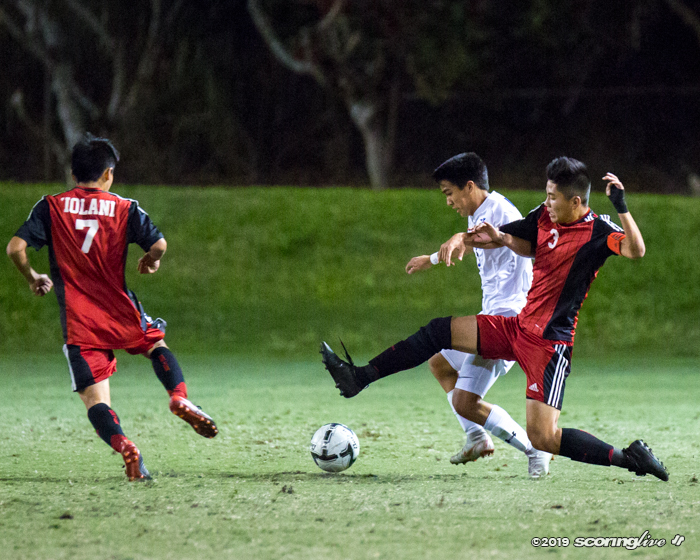 A lot of fighting for loose balls and battling out there all game. 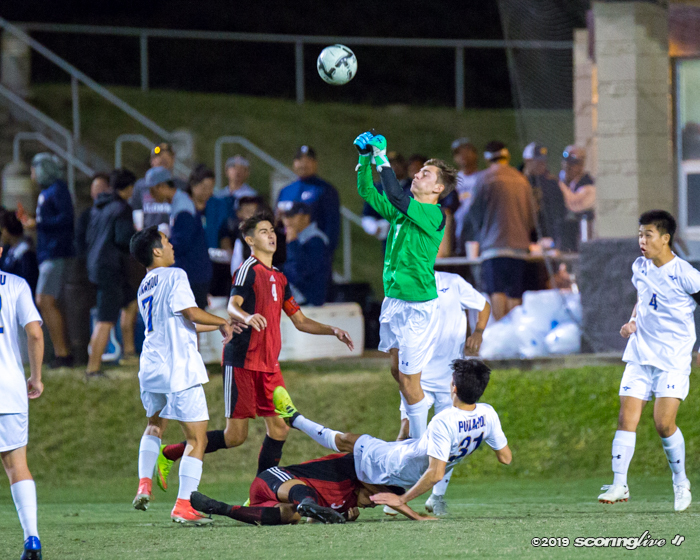 Both sides didn't want to give. 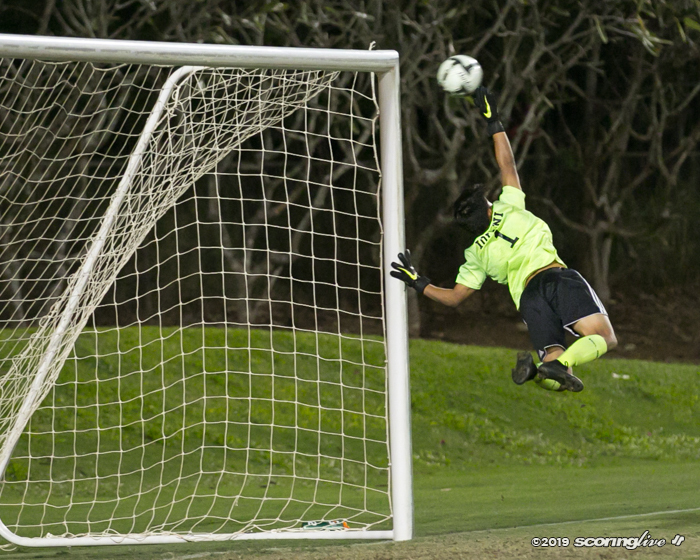 Unfortunately a bad bounce, a misplay led to that goal." 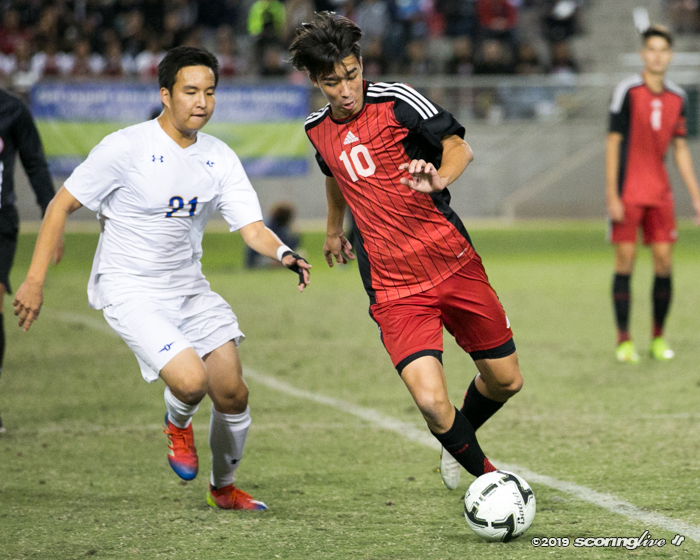 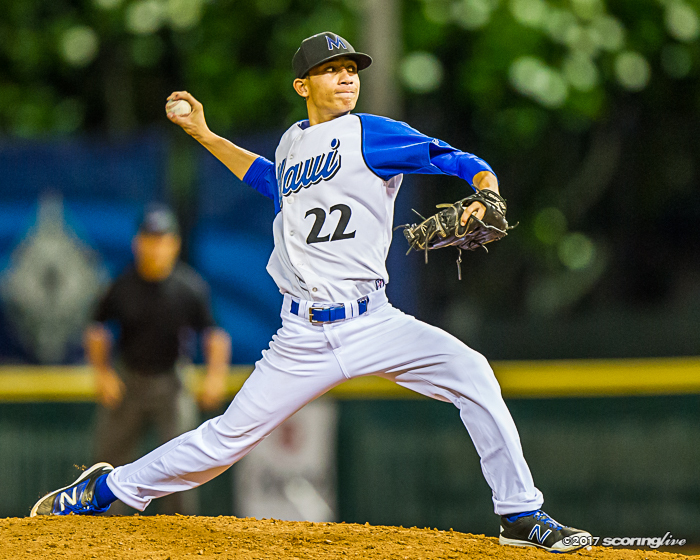 Iolani, who last won the championship in 2014, was trying for its 10th state title.